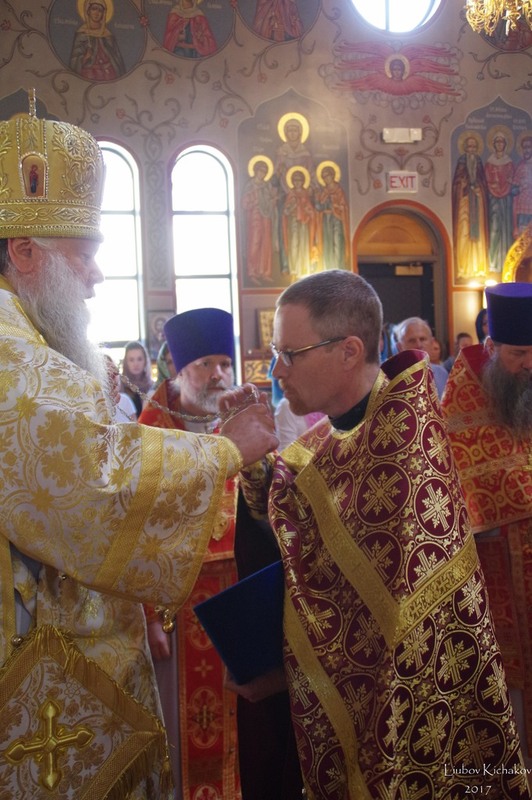 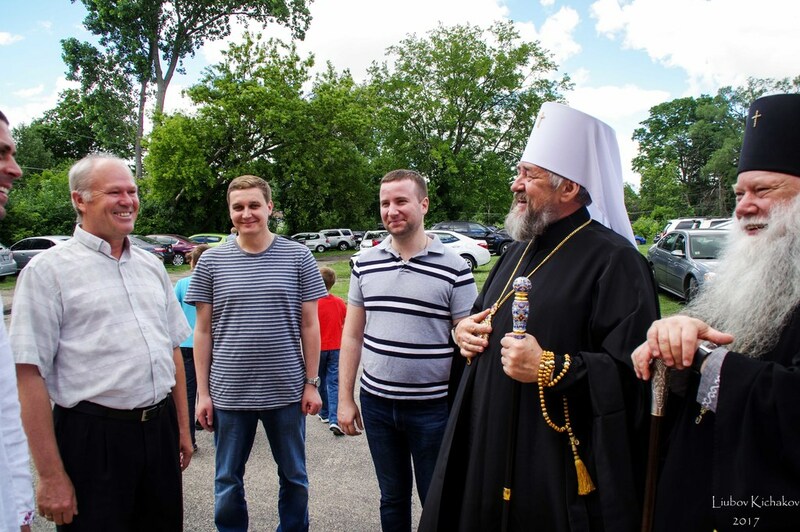 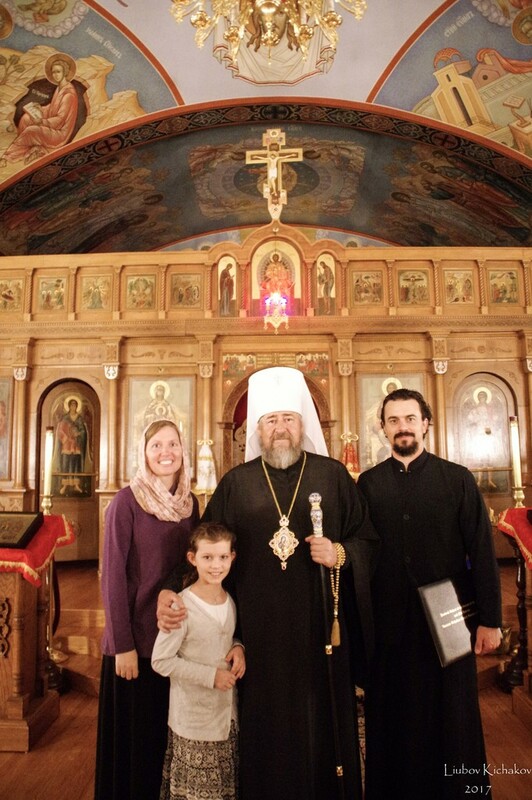 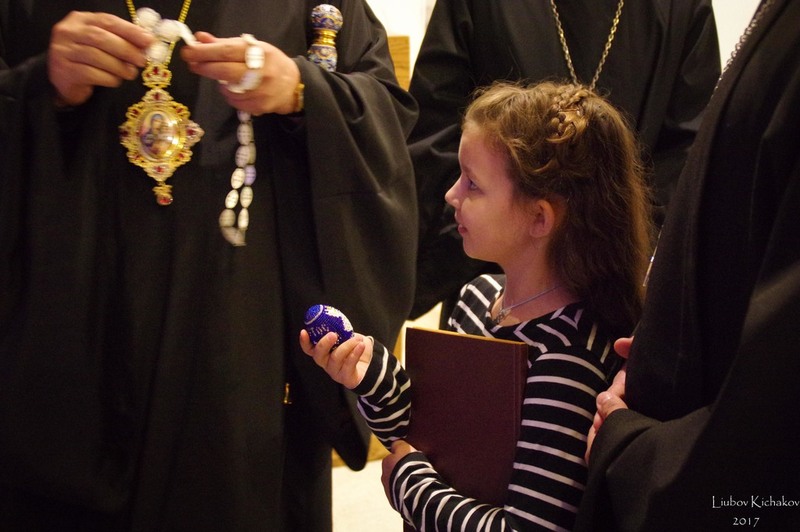 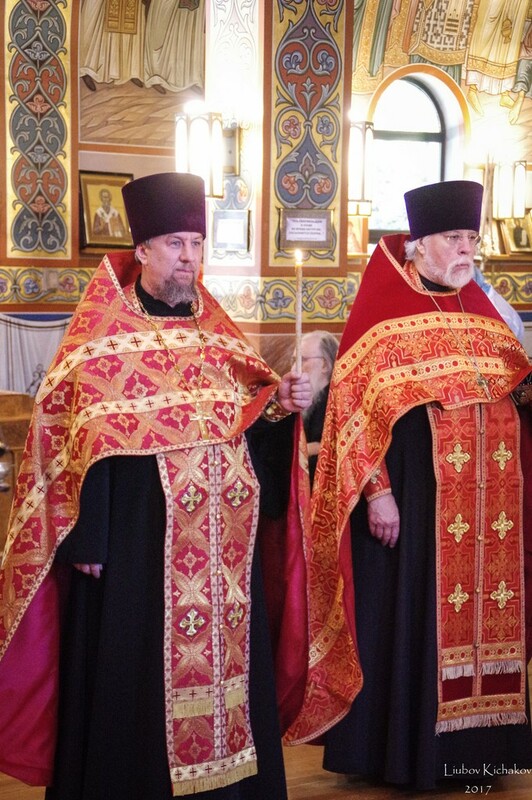 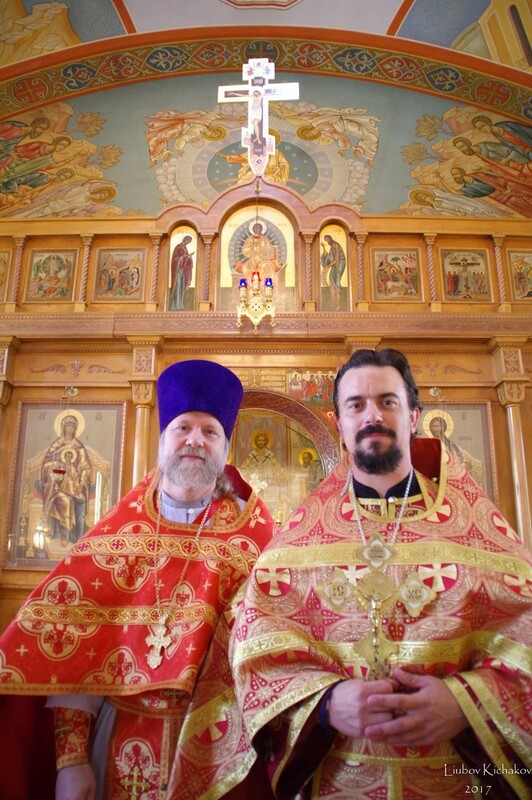 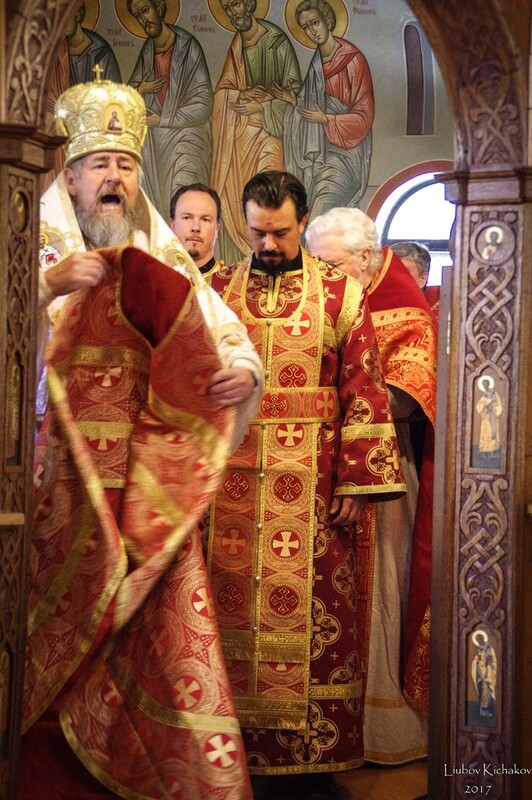 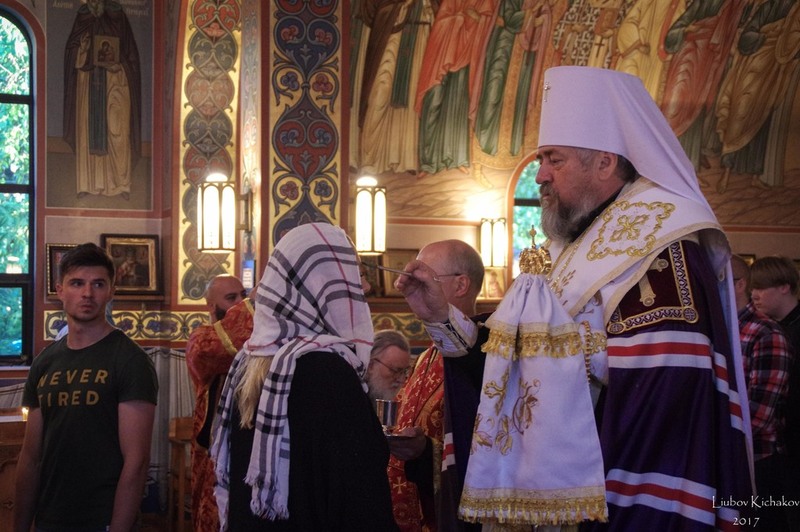 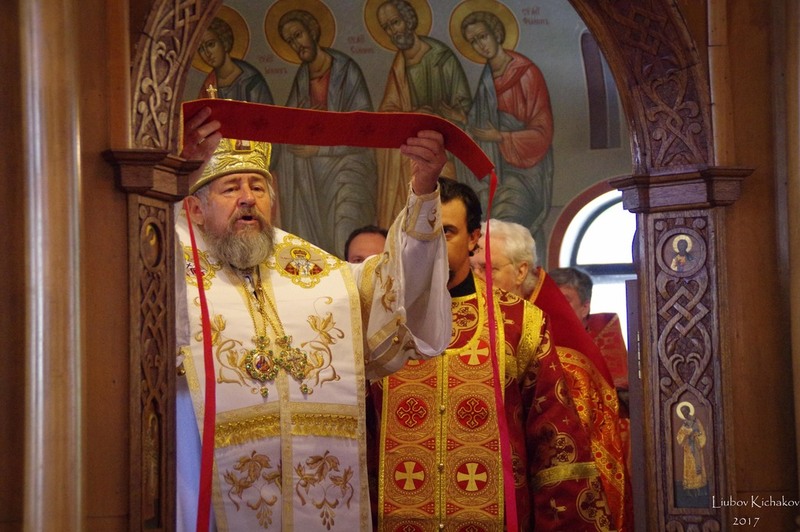 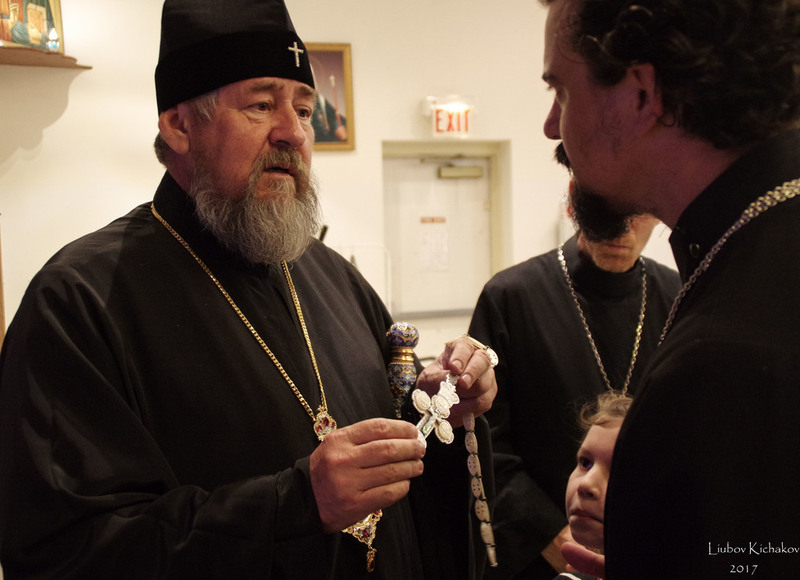 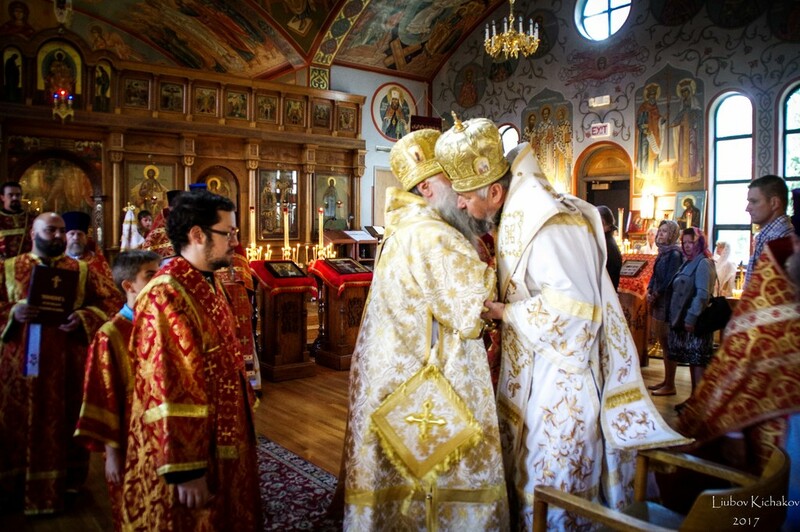 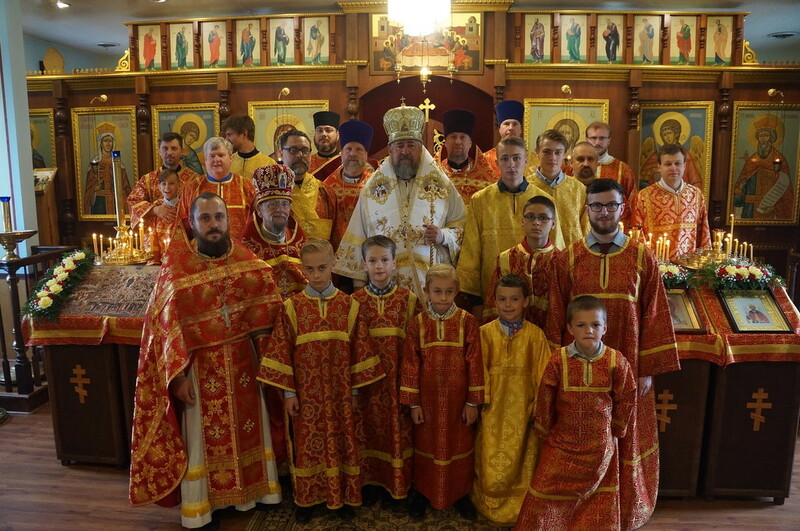 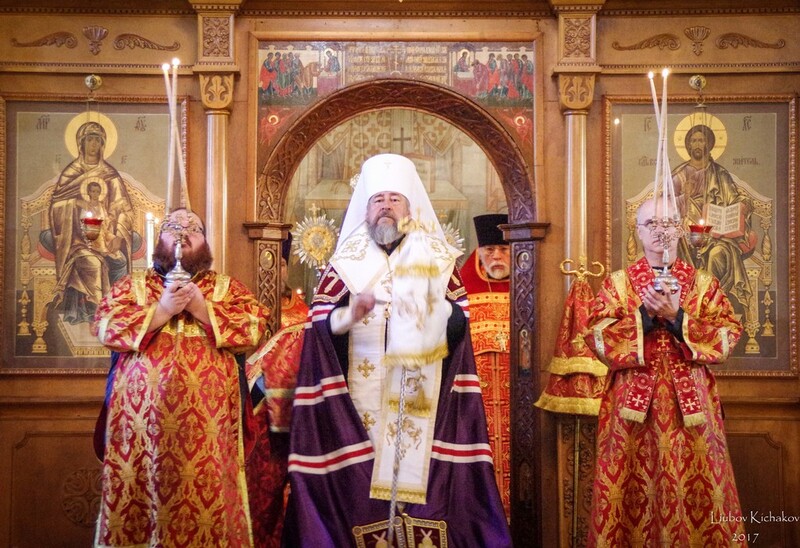 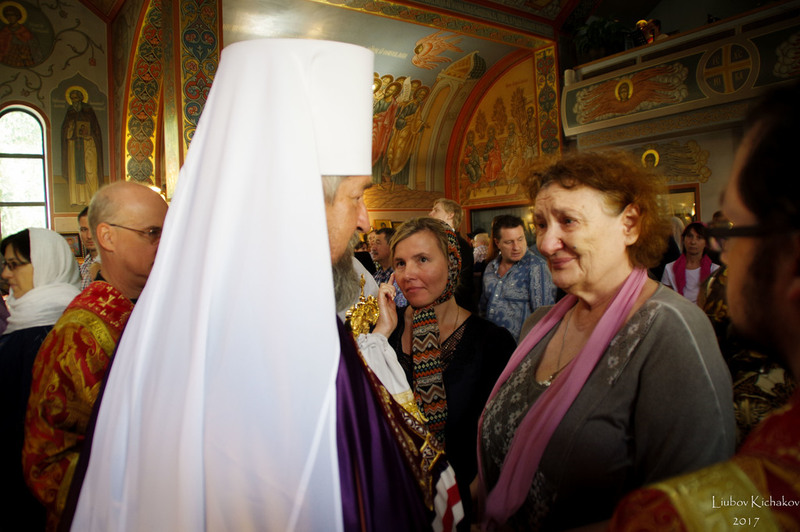 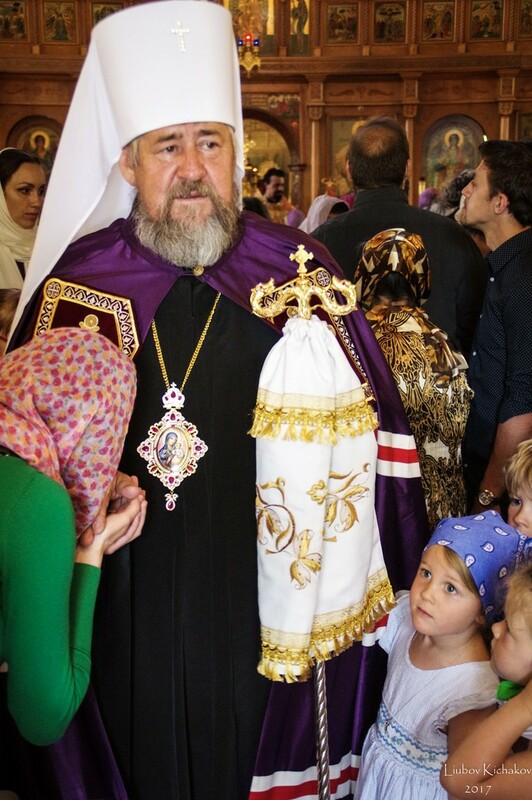 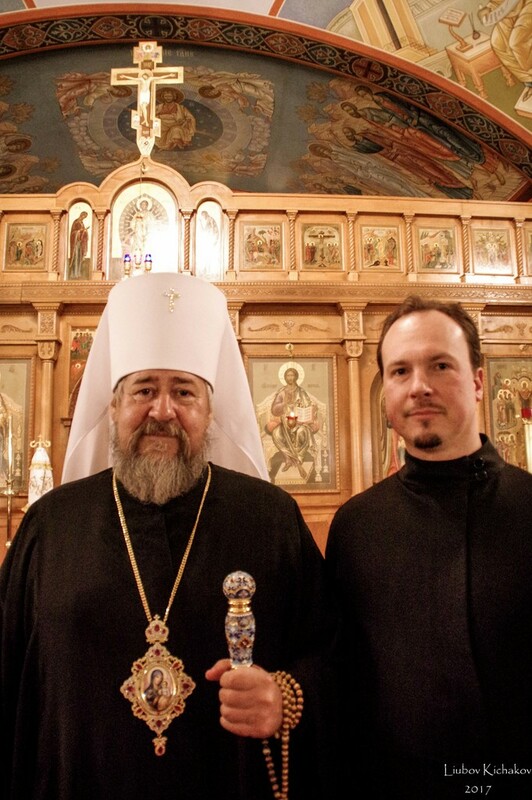 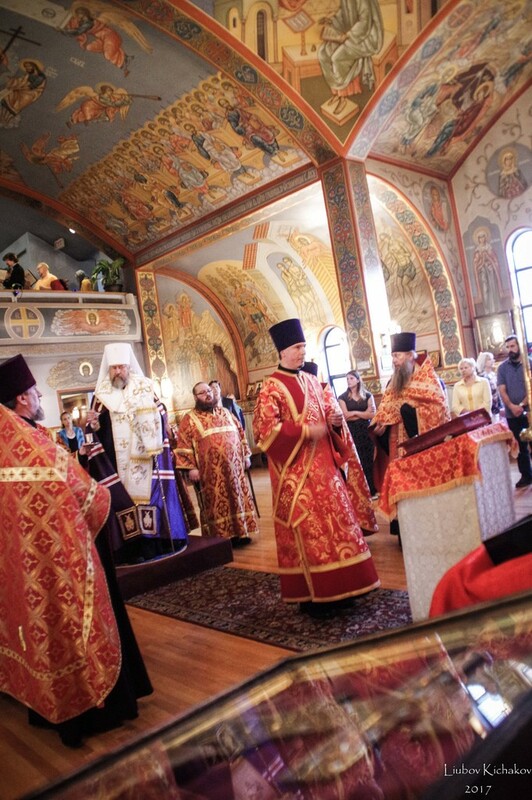 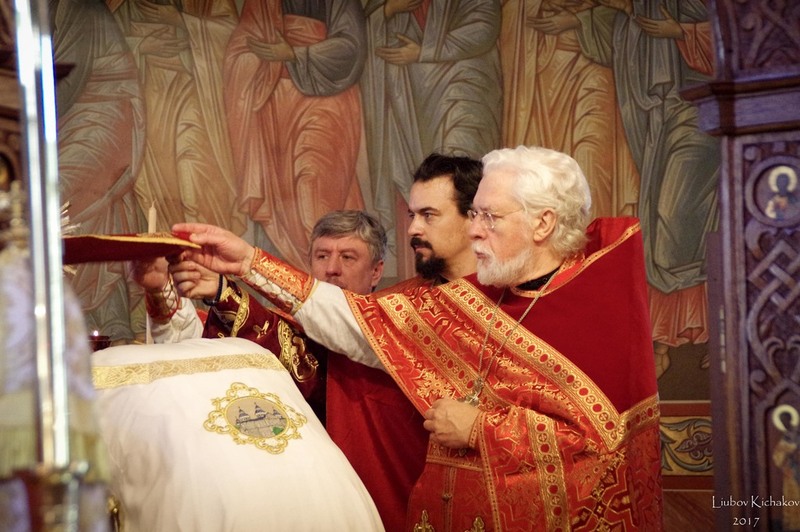 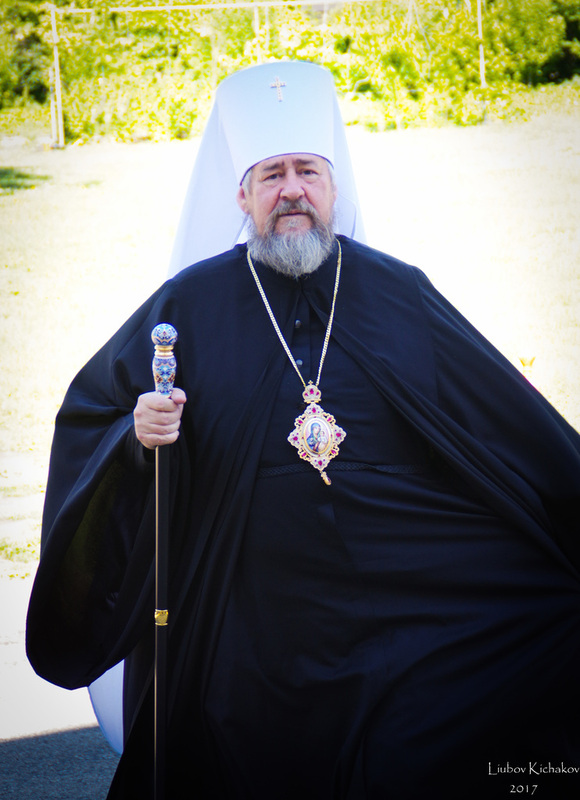 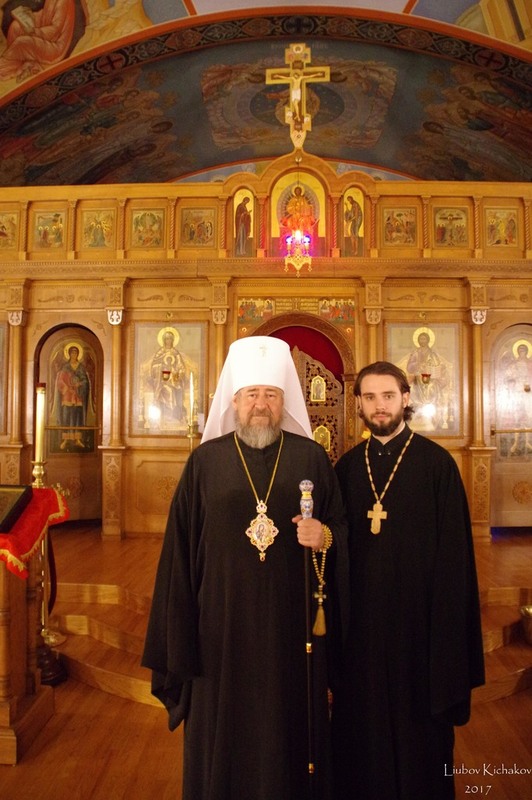 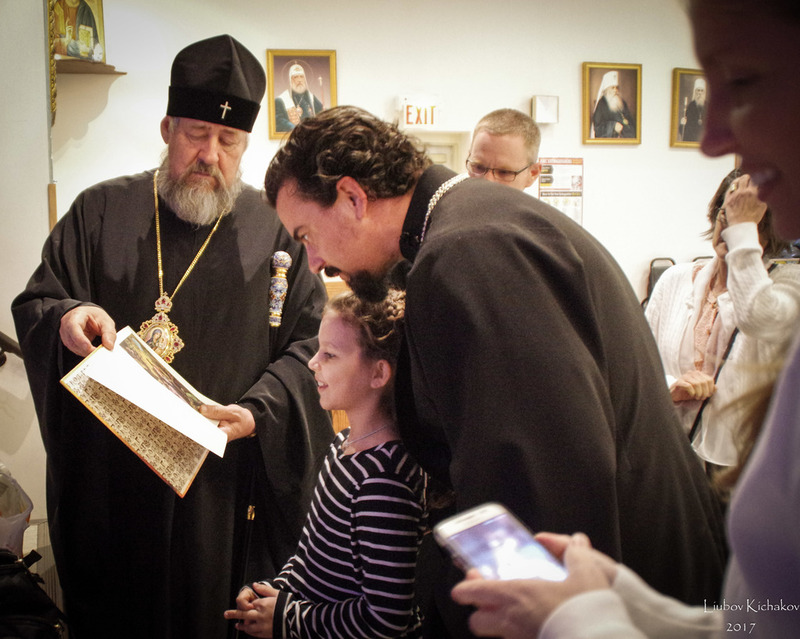 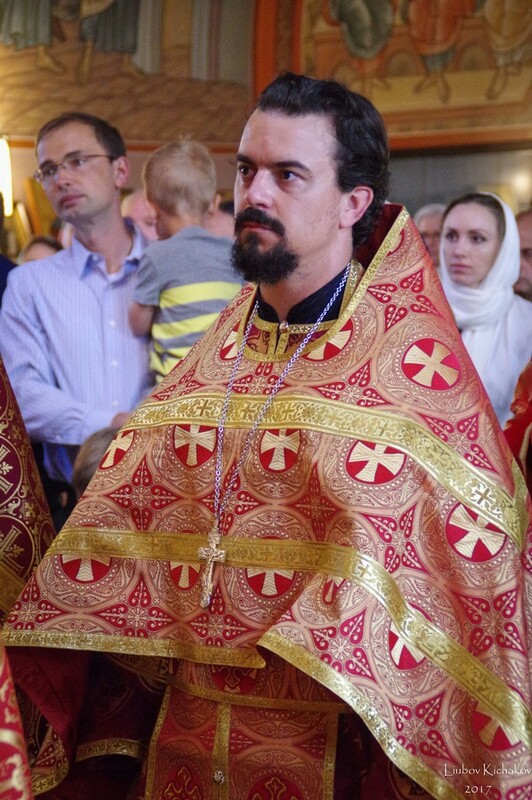 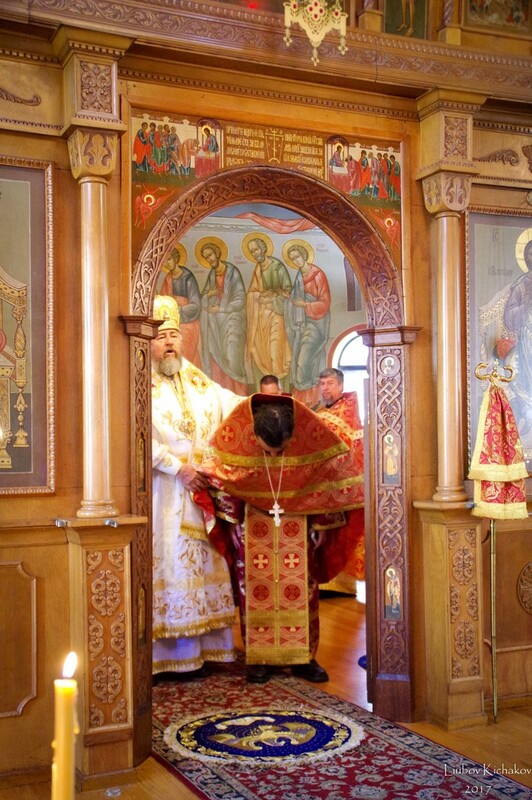 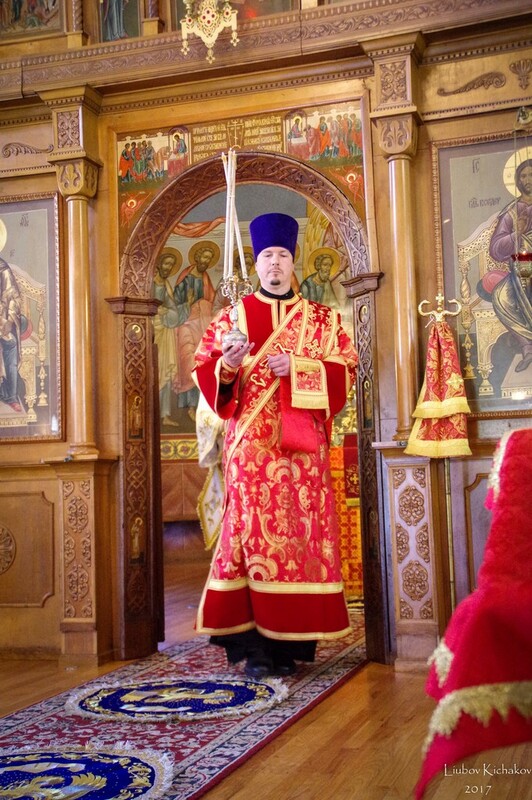 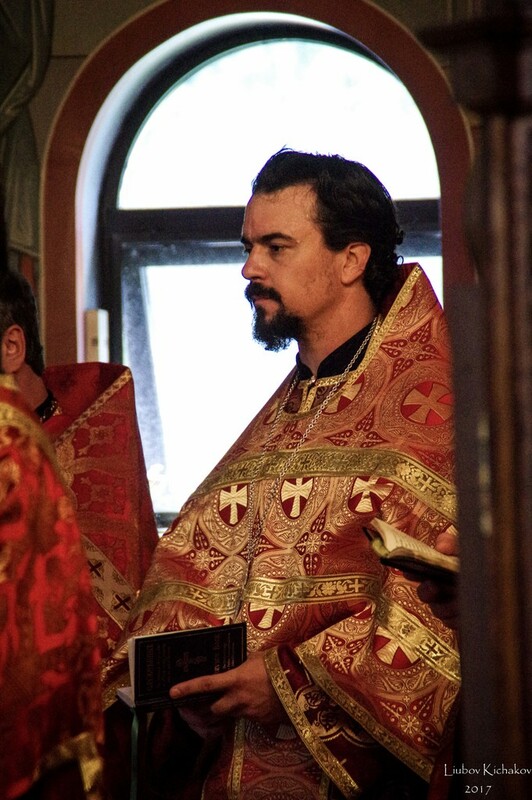 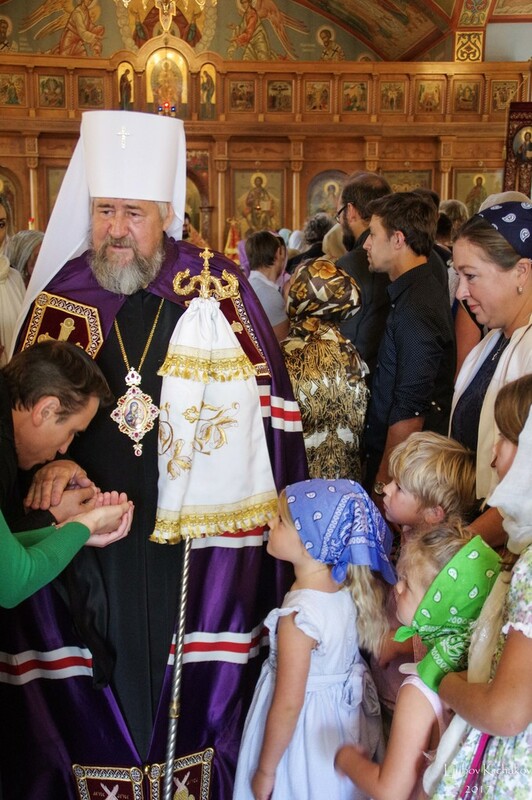 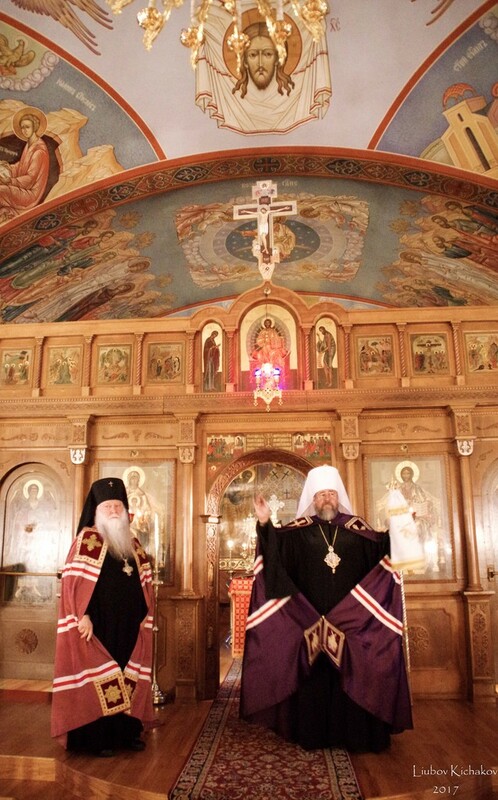 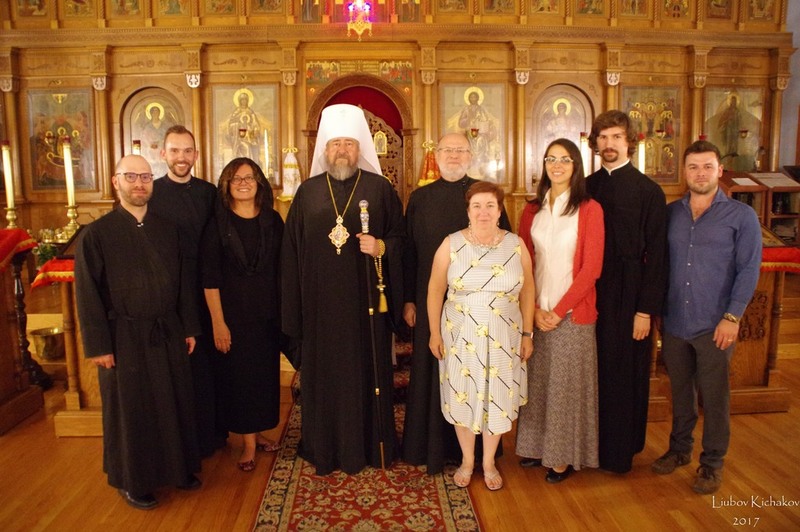 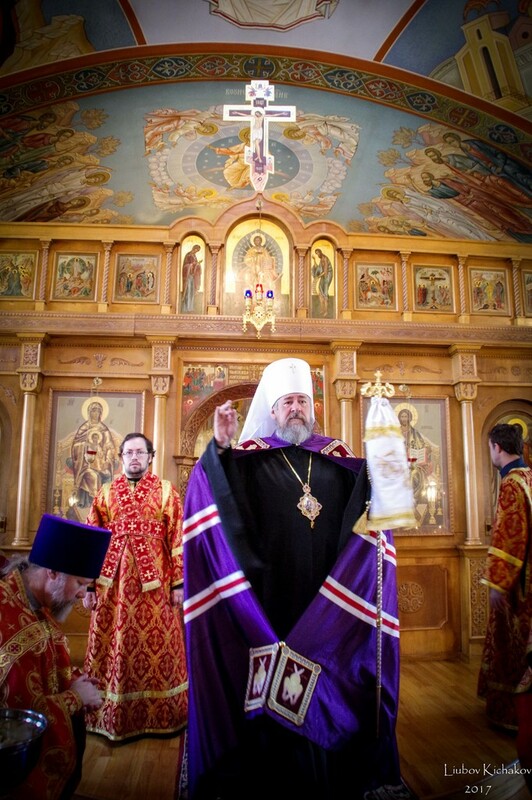 With the blessing of His Eminence Archbishop Peter, Metropolitan Phillip of Poltava & Mirgorod visited the Diocese of Chicago & Mid-America from June 17-June 25. 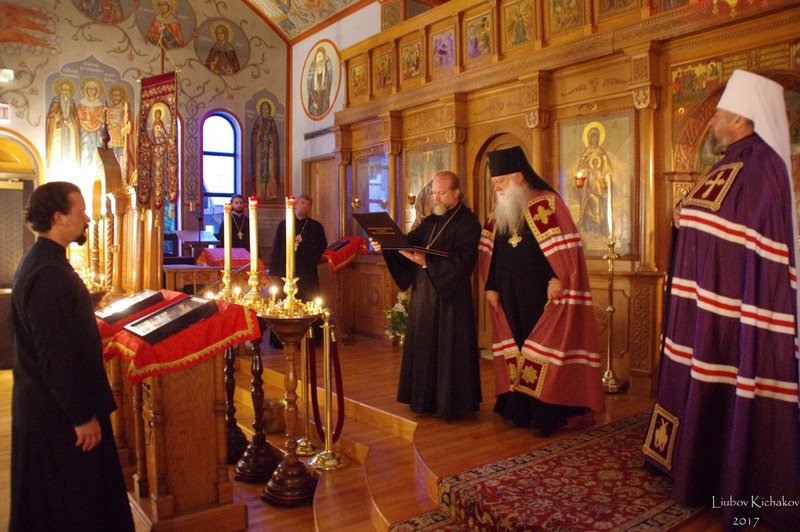 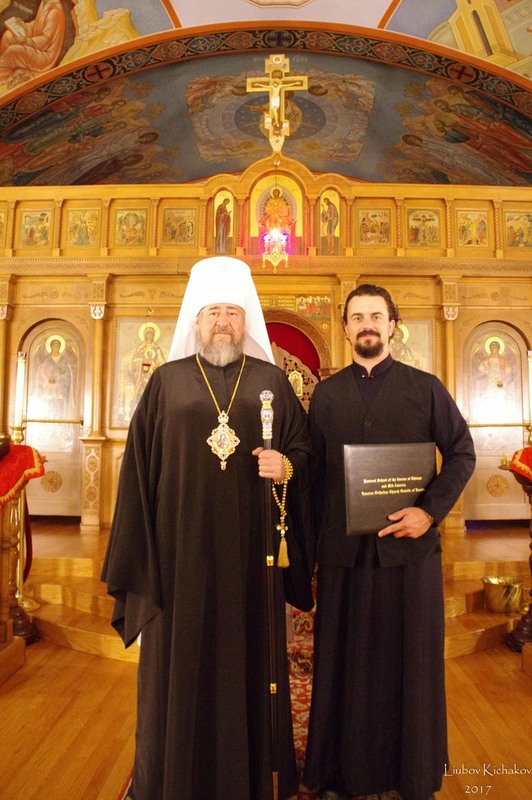 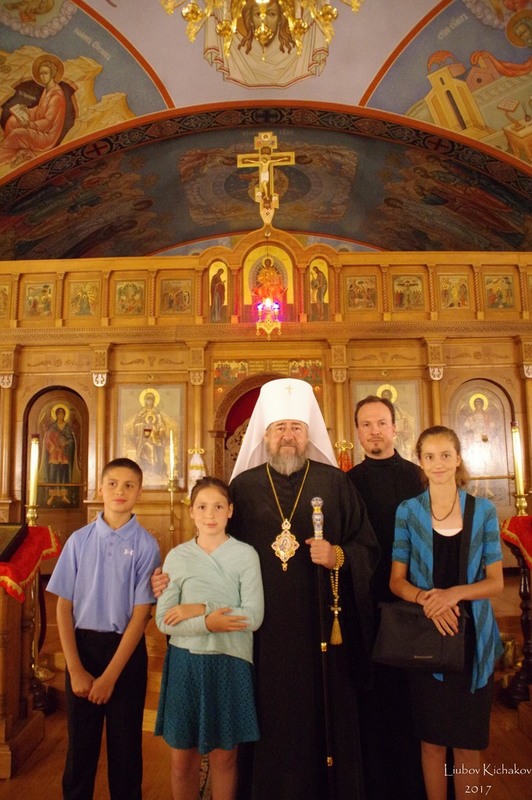 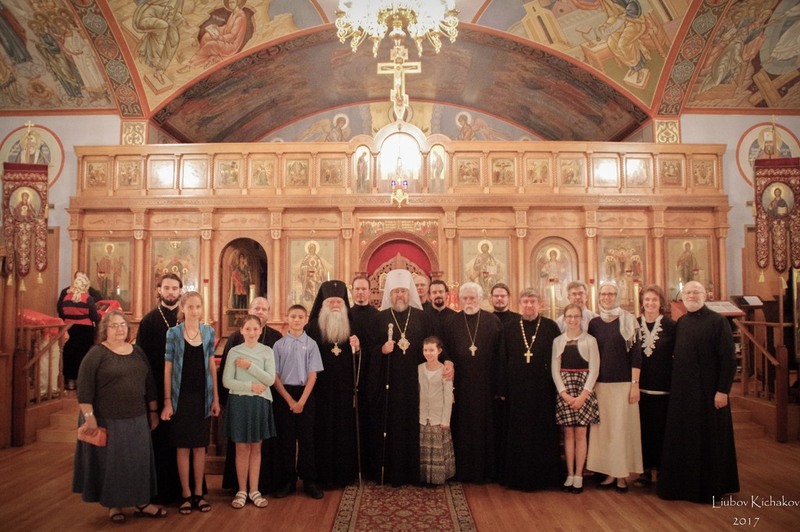 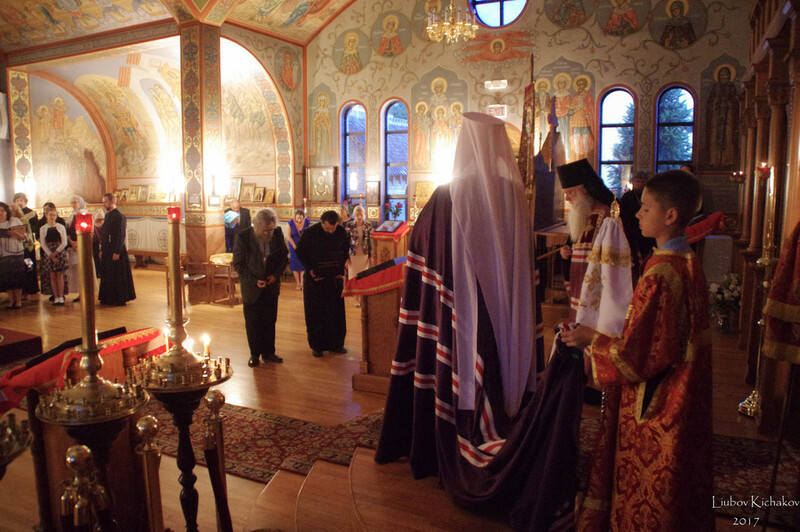 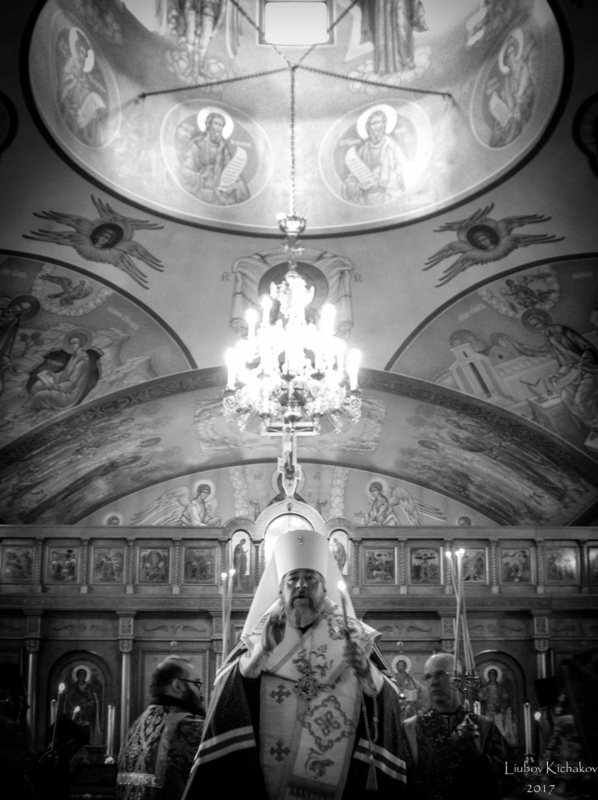 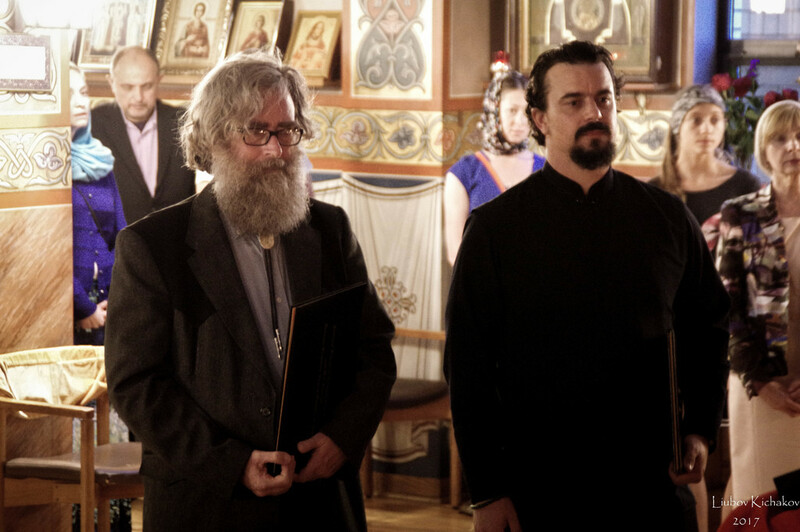 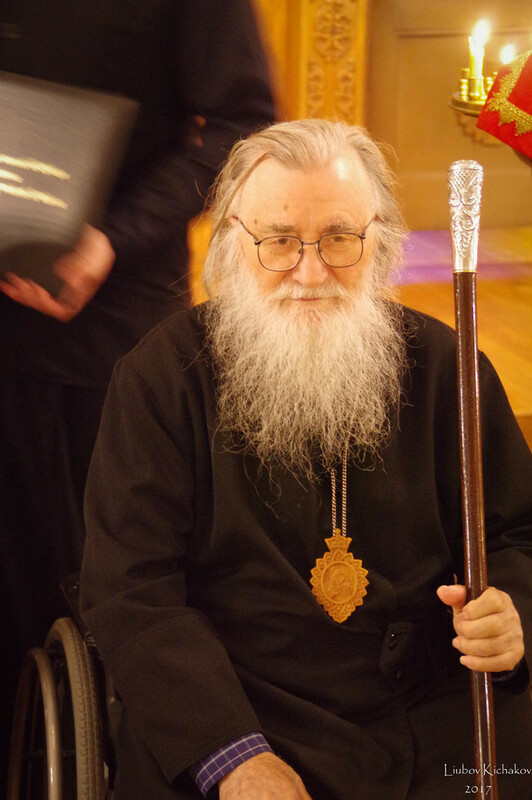 On June 17 His Eminence led the All Night Vigil at the Dormition Cathedral in Ferndale, Michigan. 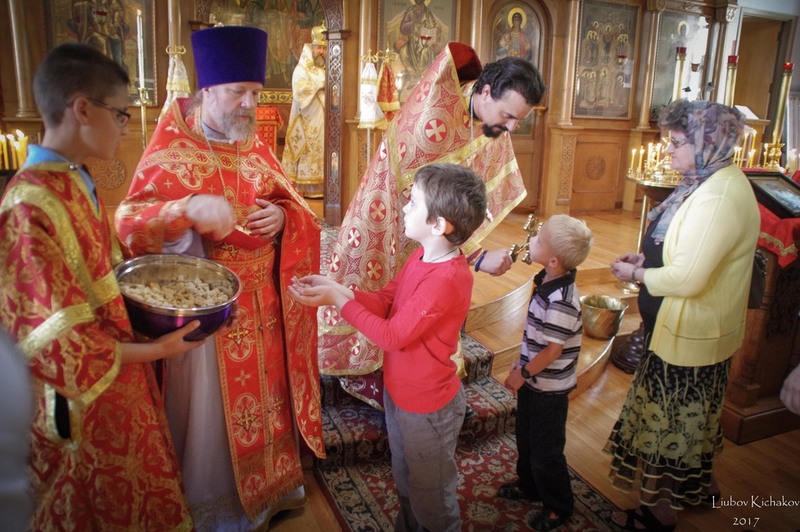 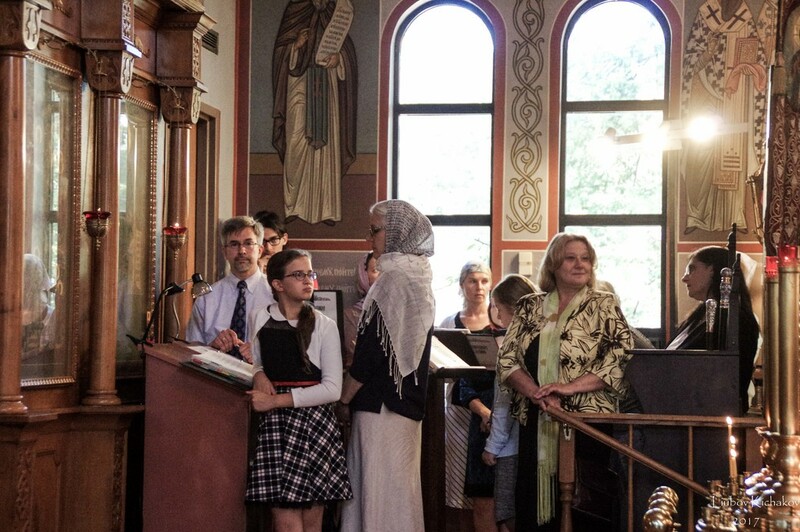 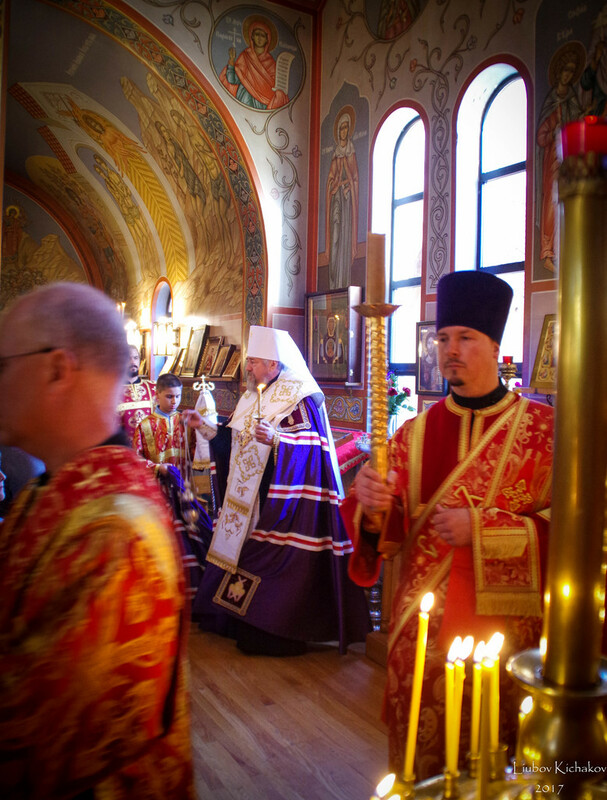 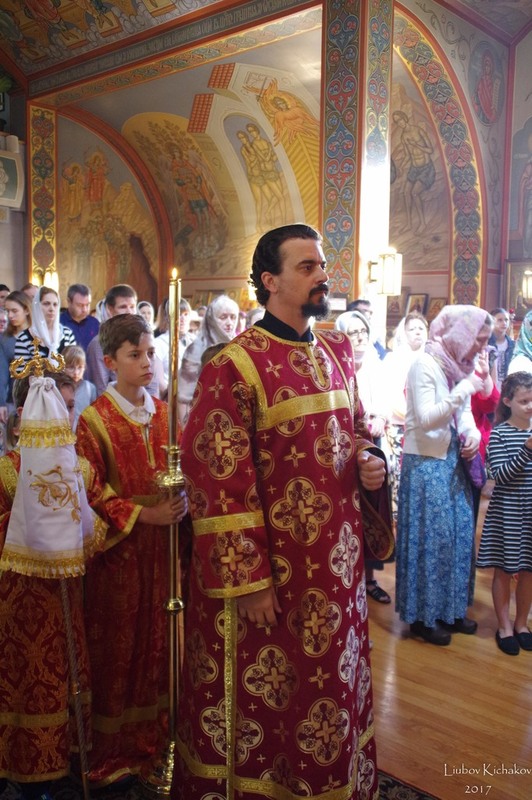 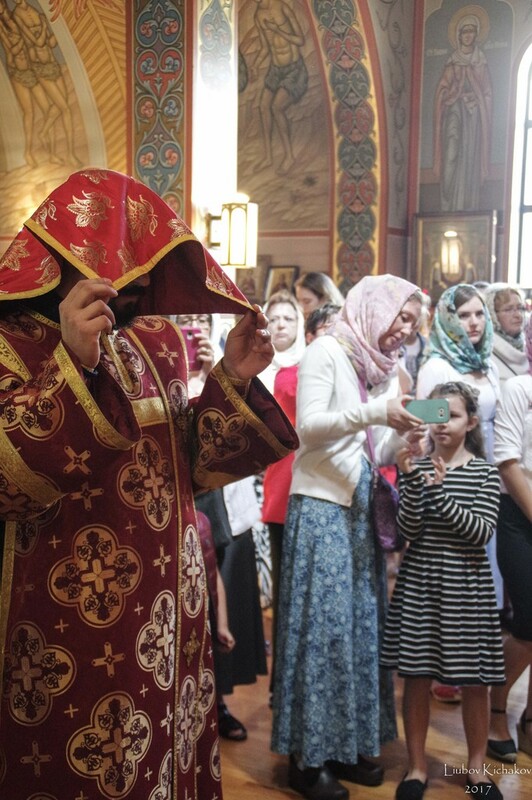 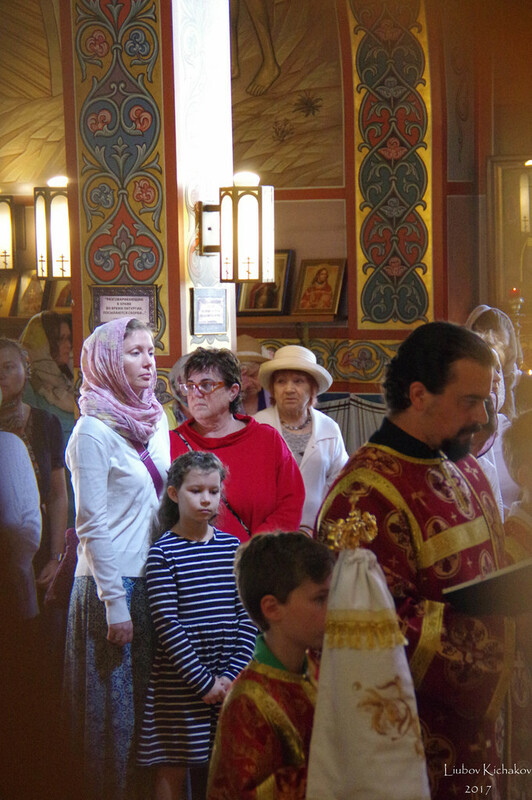 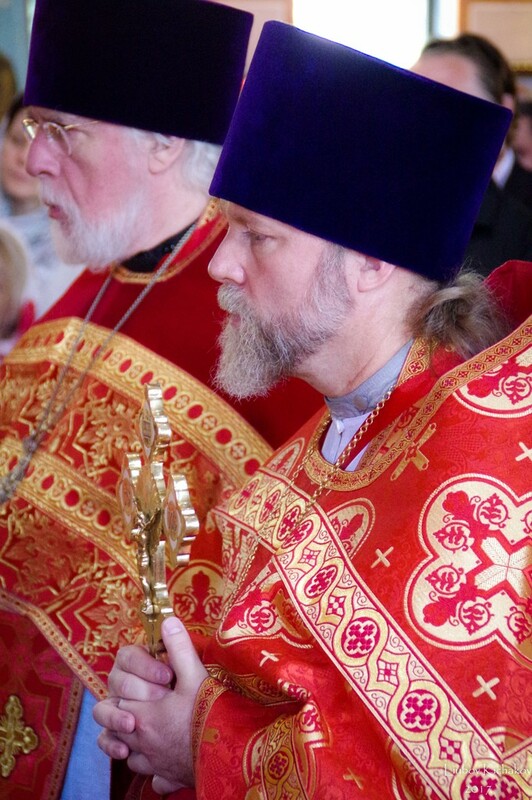 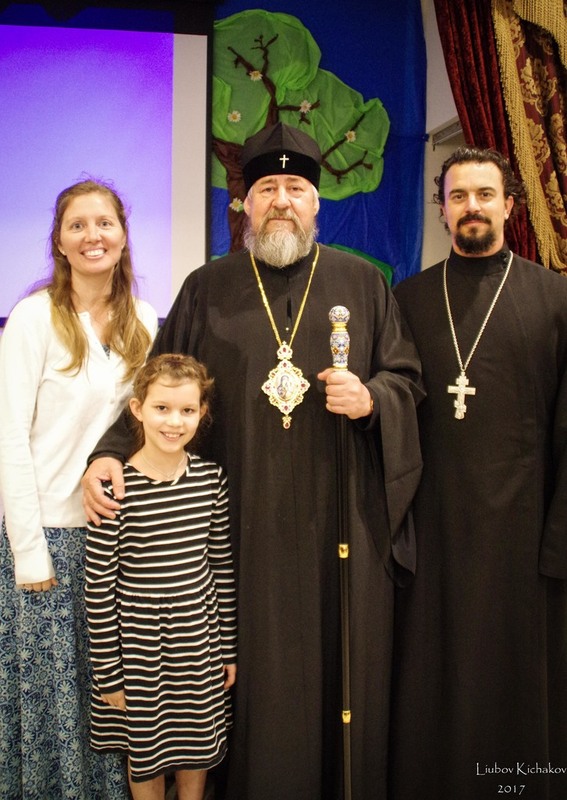 On the next day – the Sunday of All Saints of Russia, His Eminence presided at the Divine Liturgy at the St. Vladimir parish in Ann Arbor, Michigan. 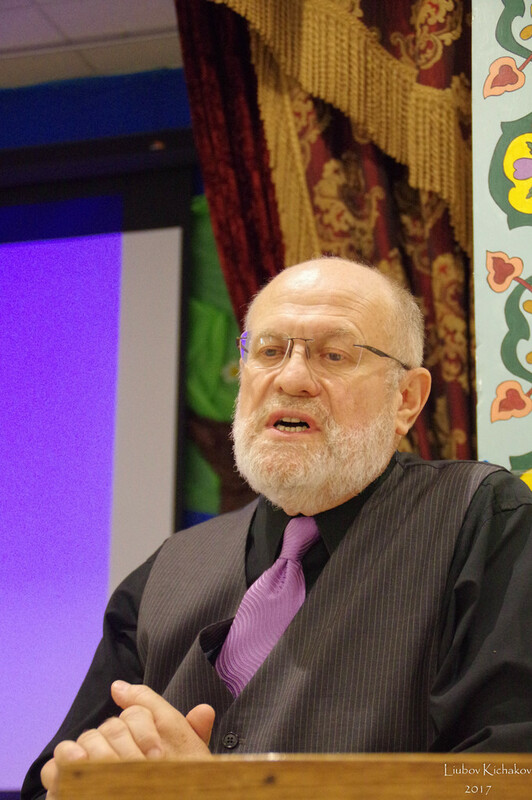 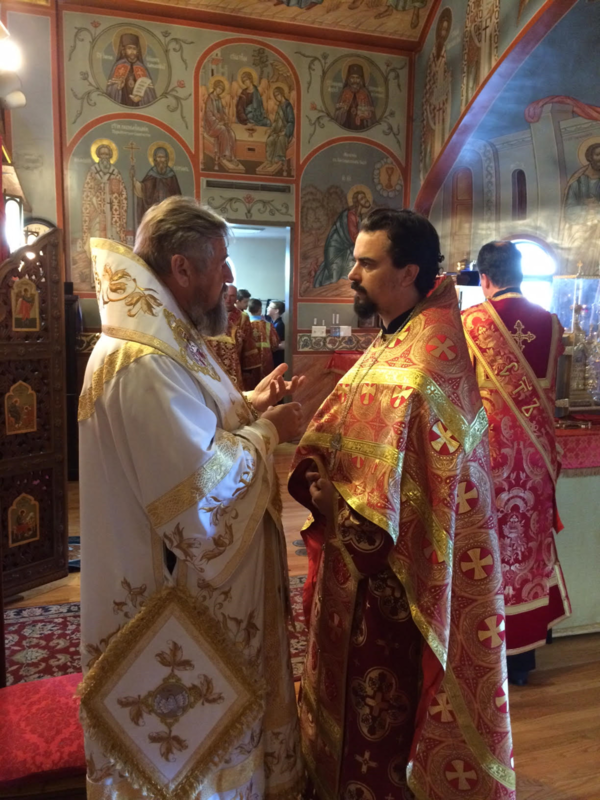 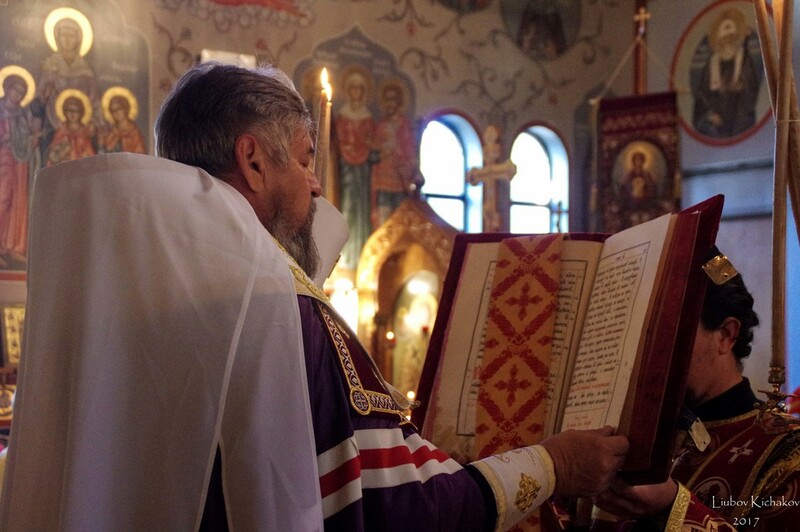 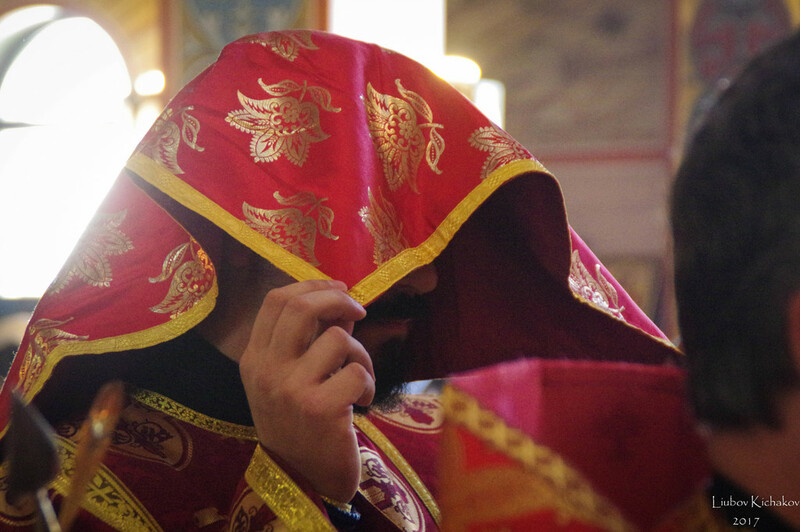 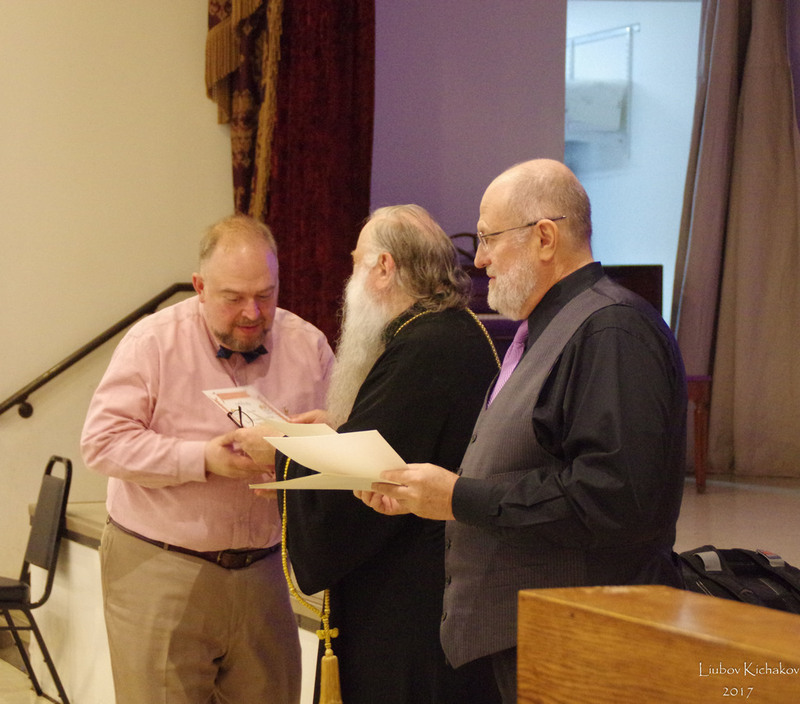 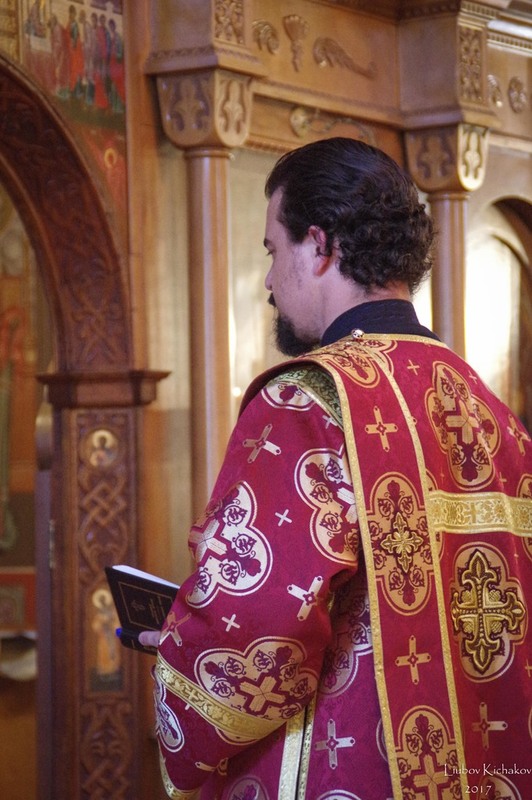 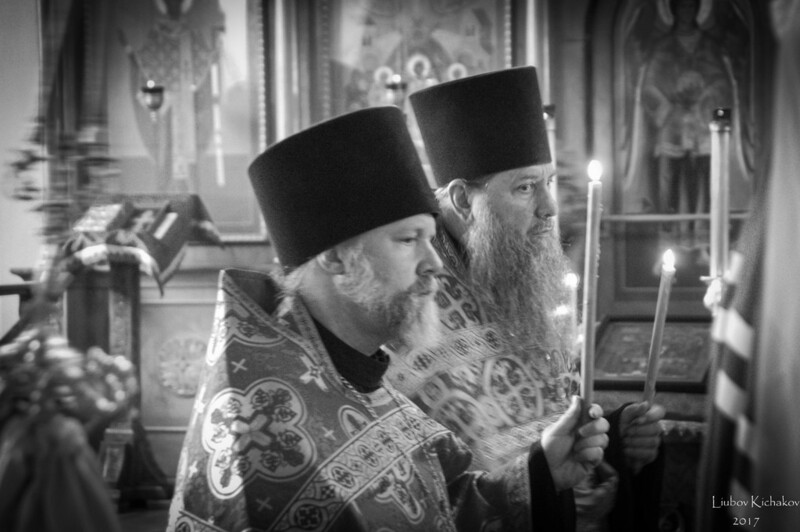 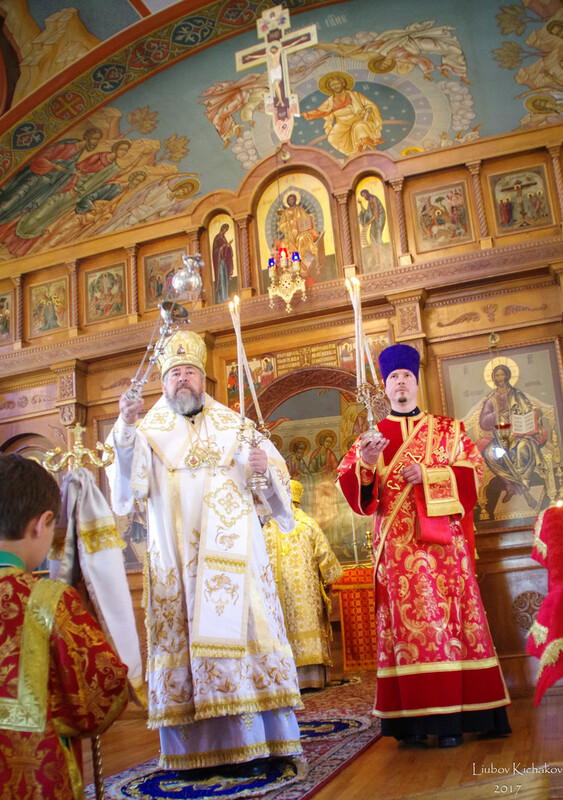 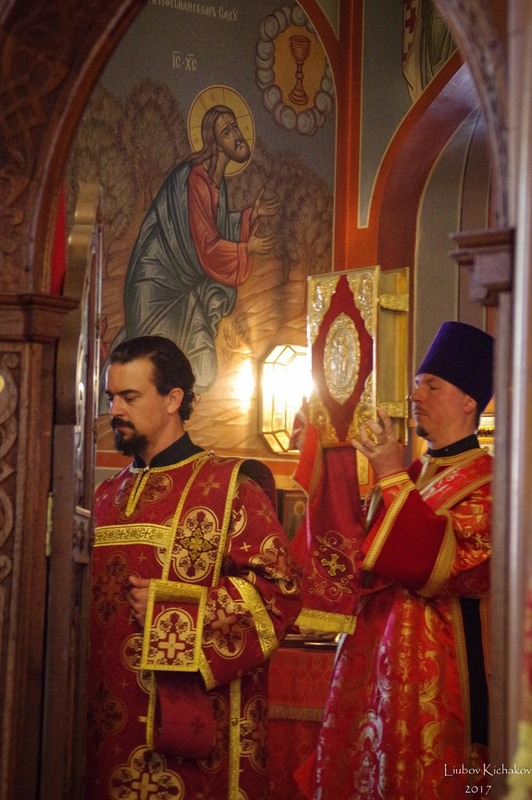 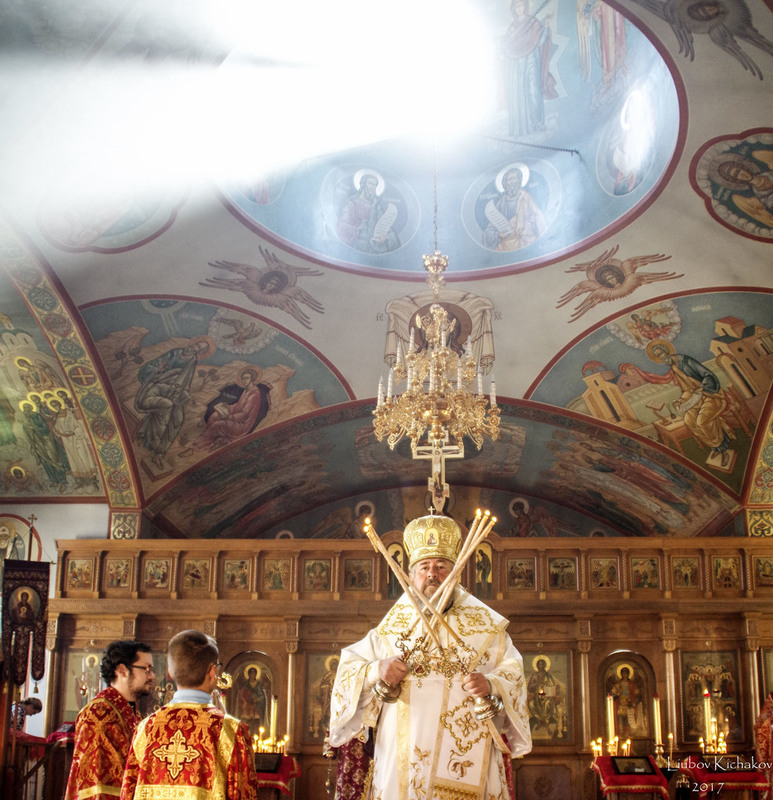 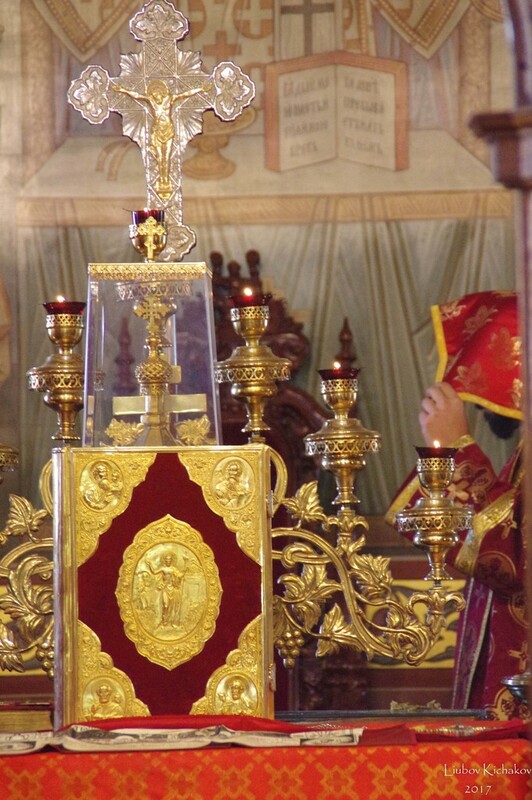 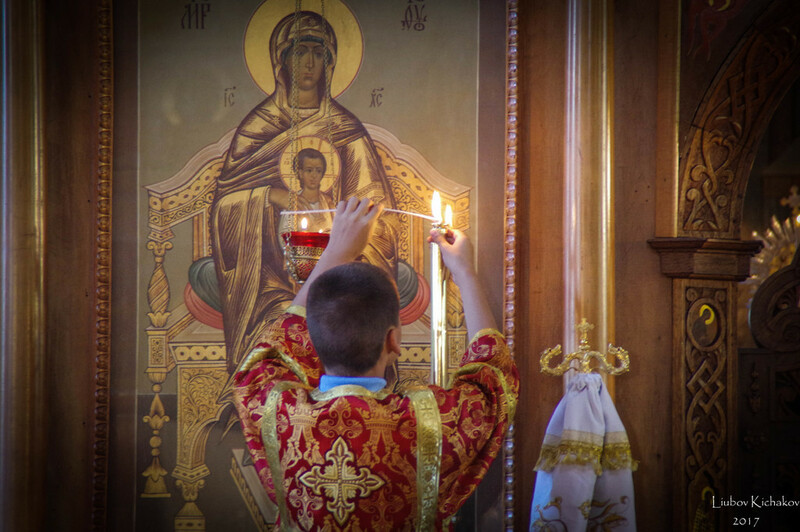 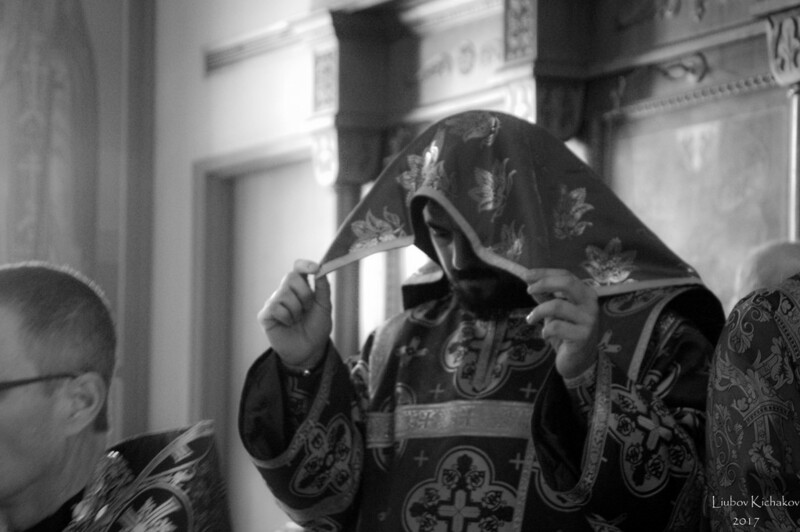 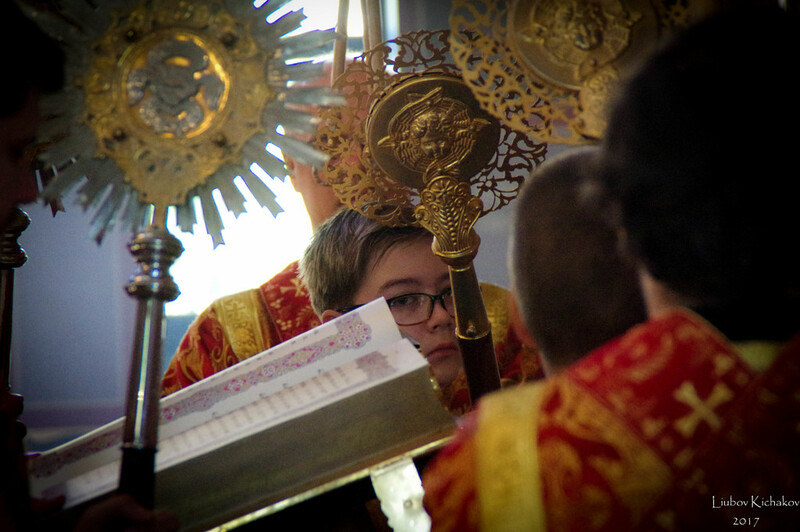 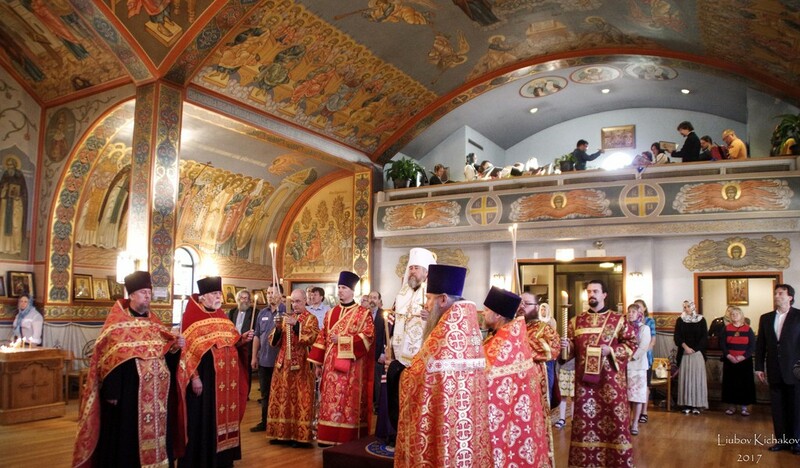 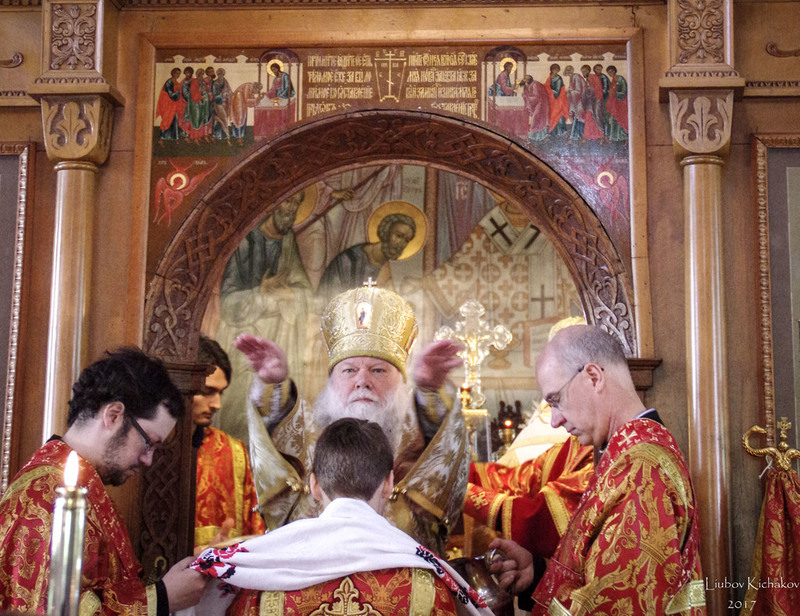 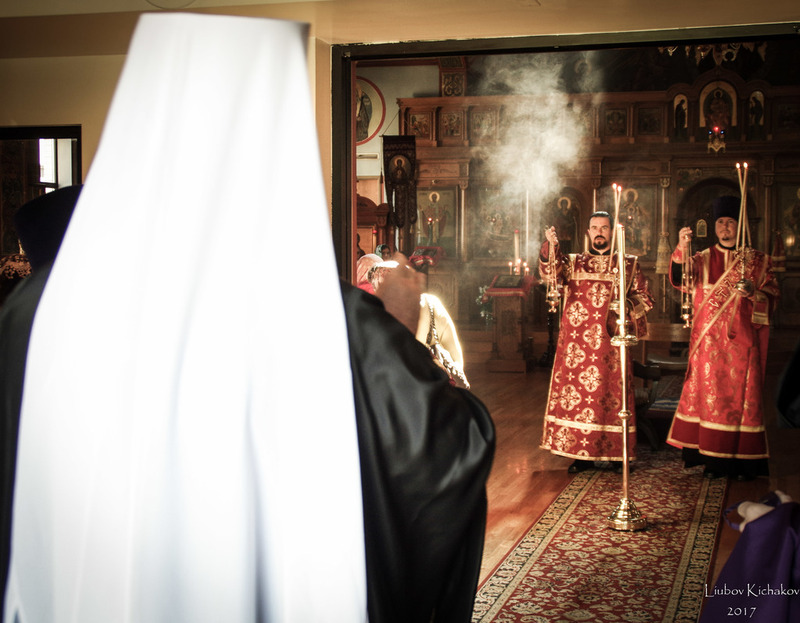 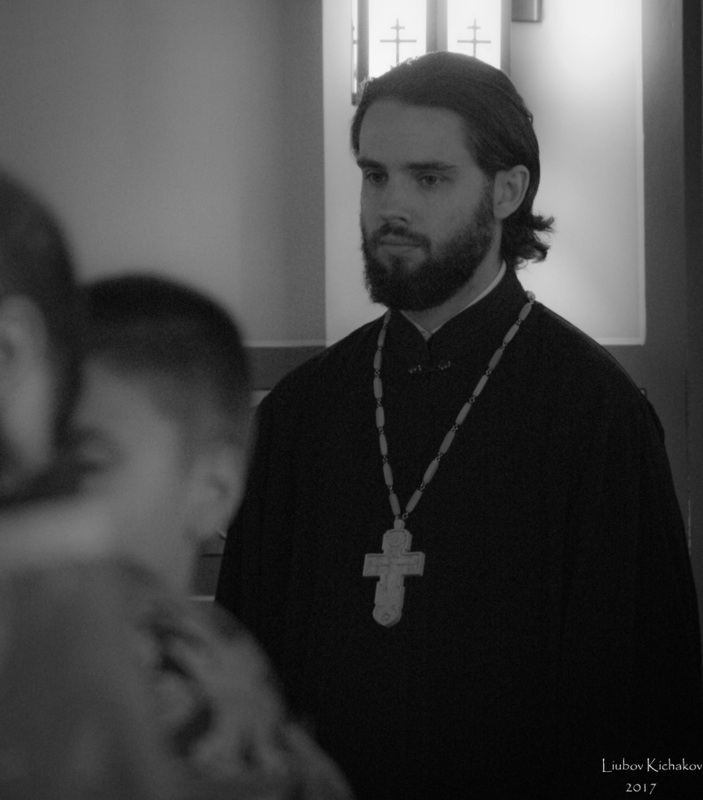 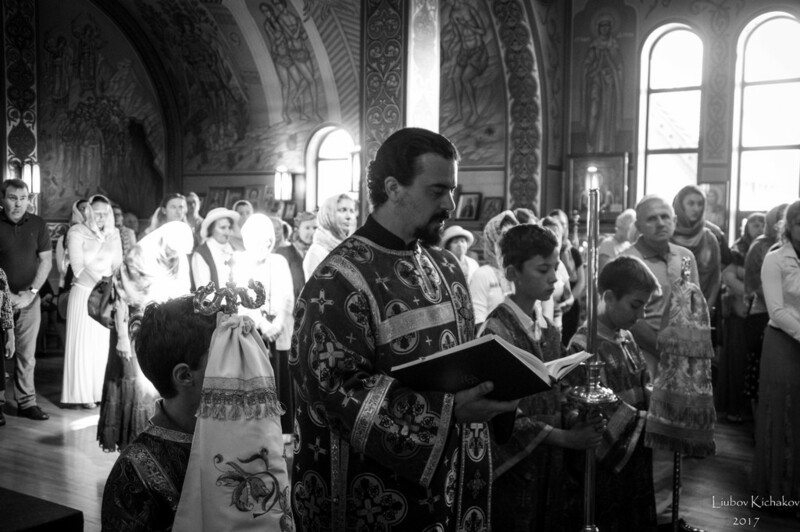 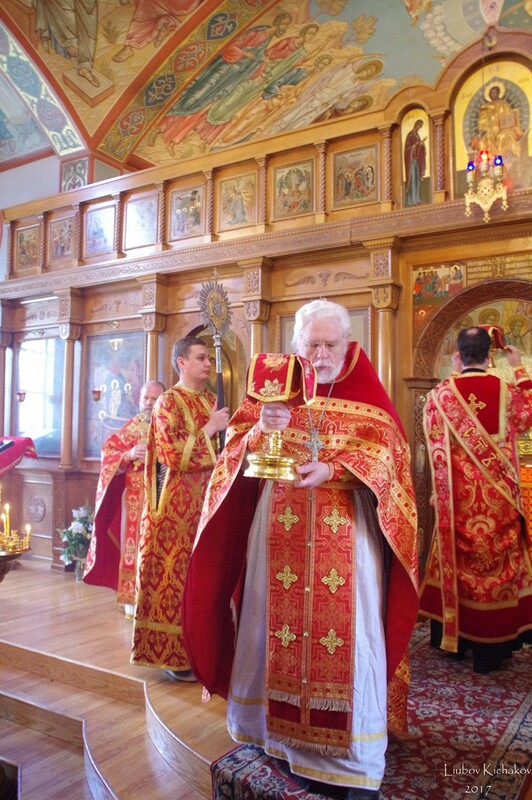 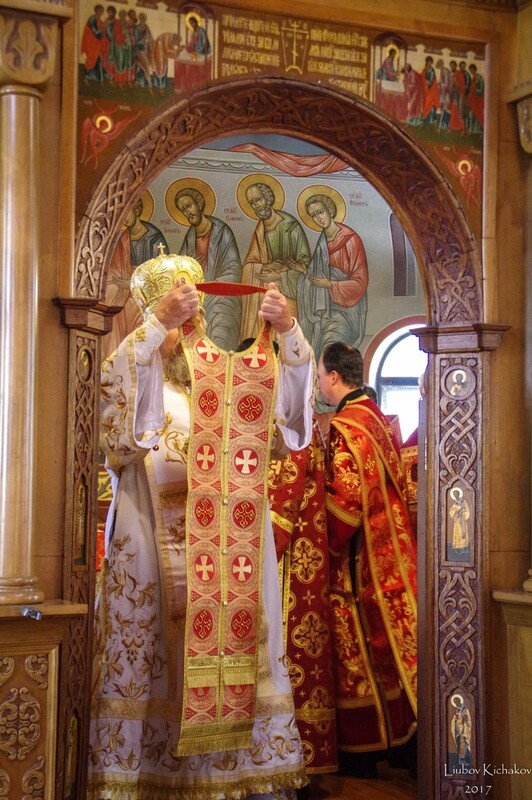 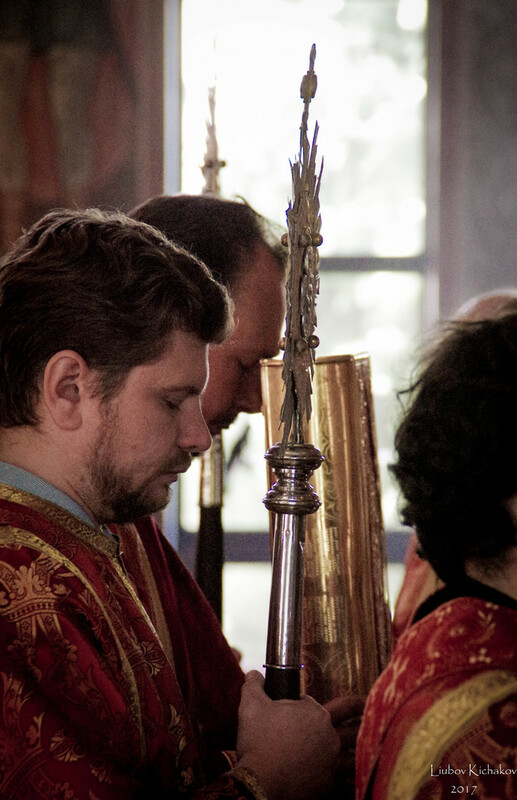 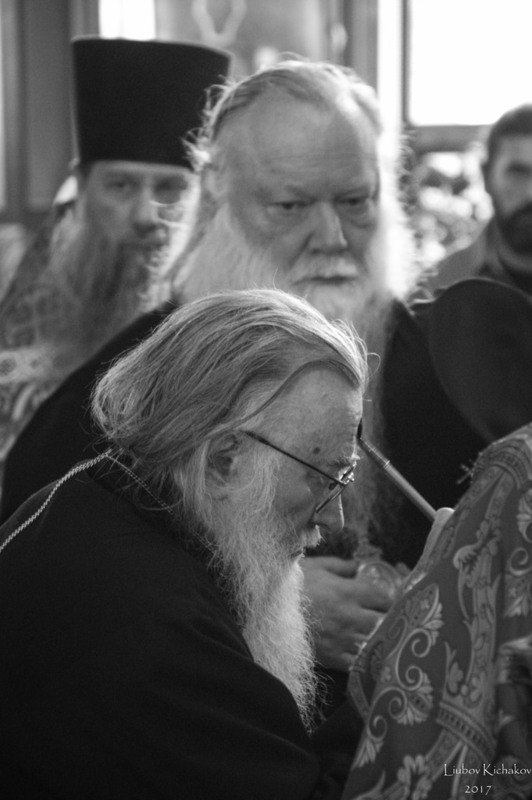 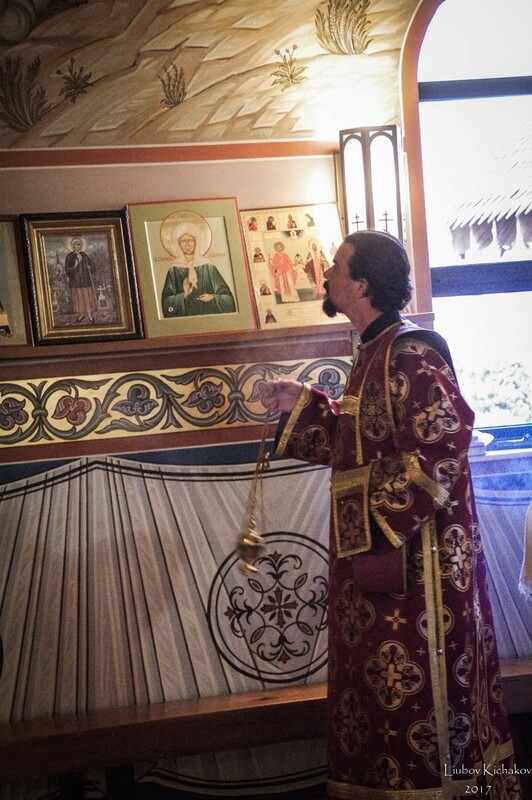 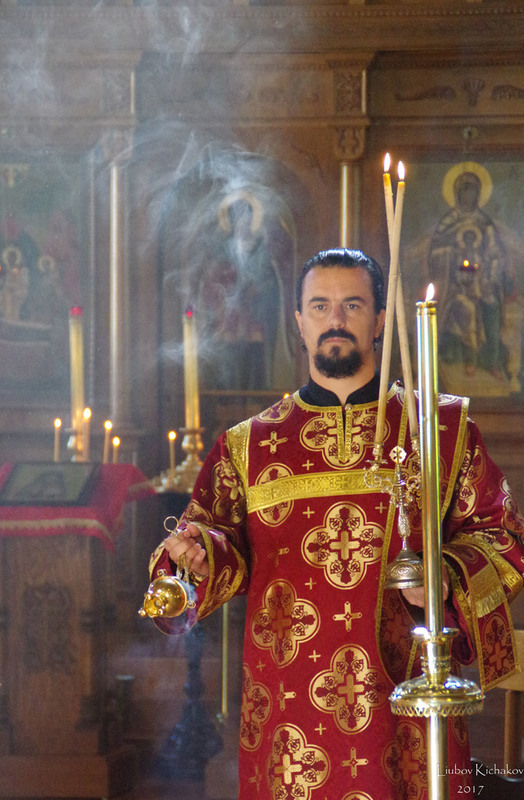 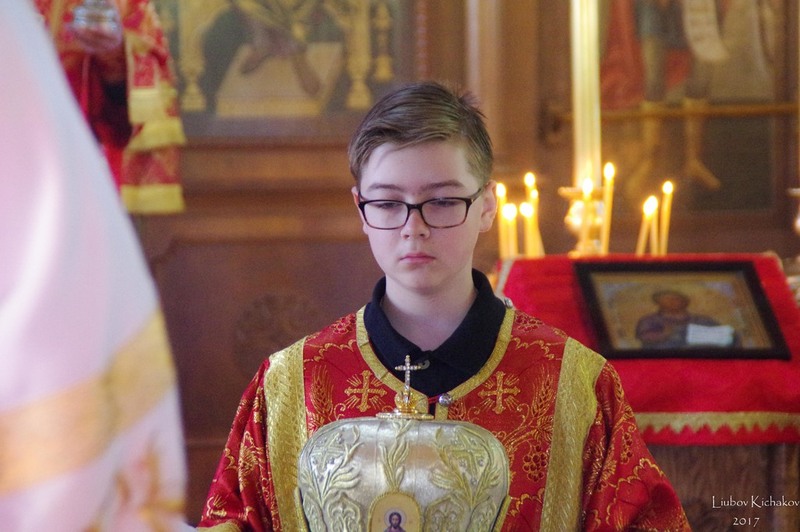 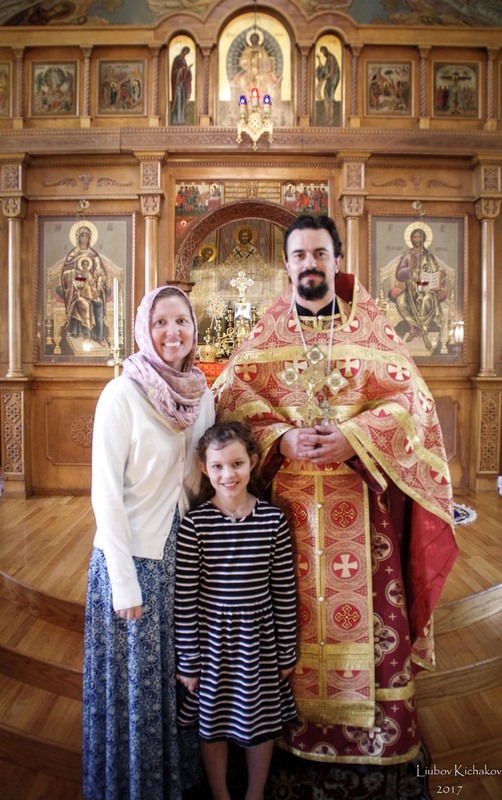 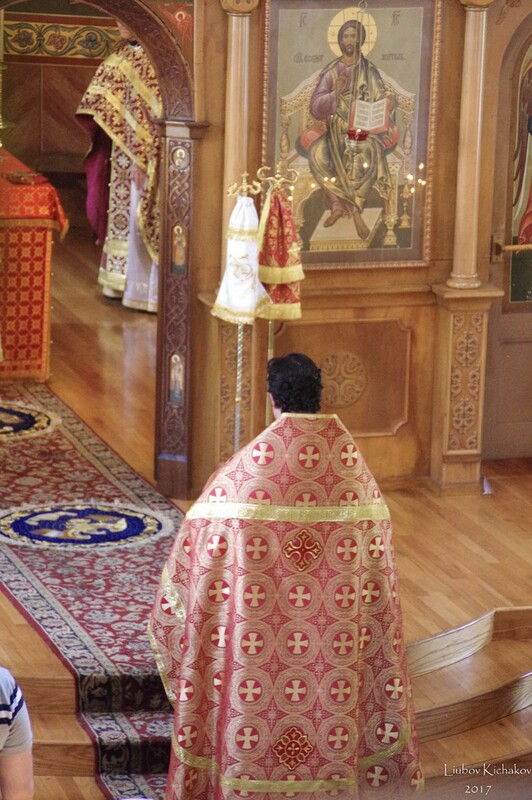 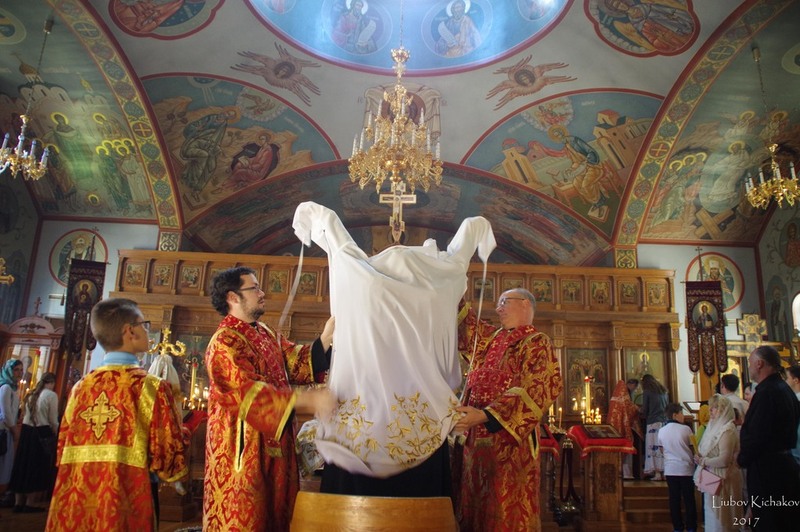 Pictures of the Divine Liturgy in Ann Arbor that day can be found at this LINK. 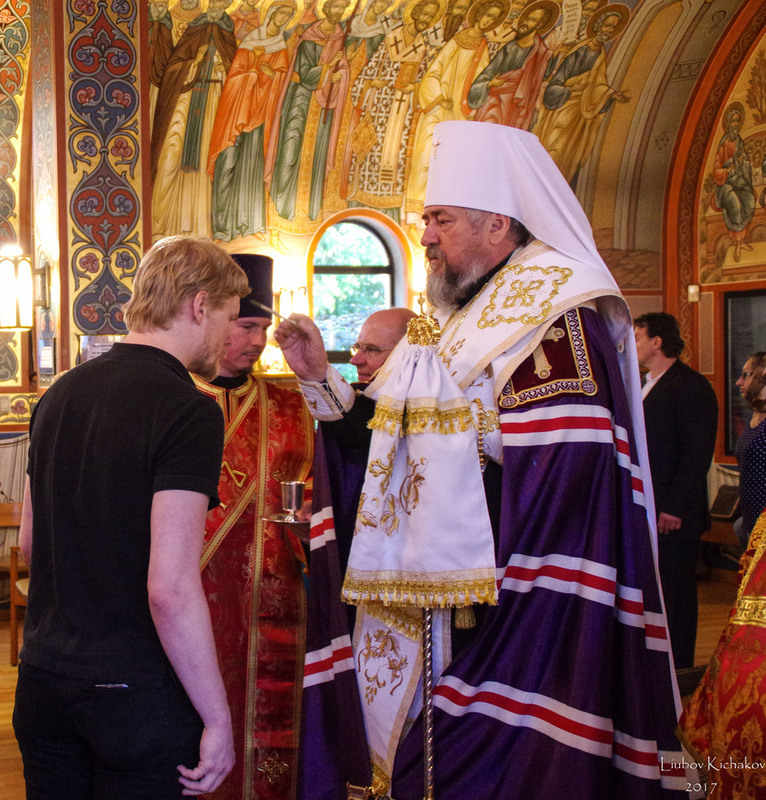 On Saturday, June 24 His Eminence arrived in the ruling city of the diocese and observed the final exams and thesis defenses of the graduating seniors of the Pastoral School of the diocese. 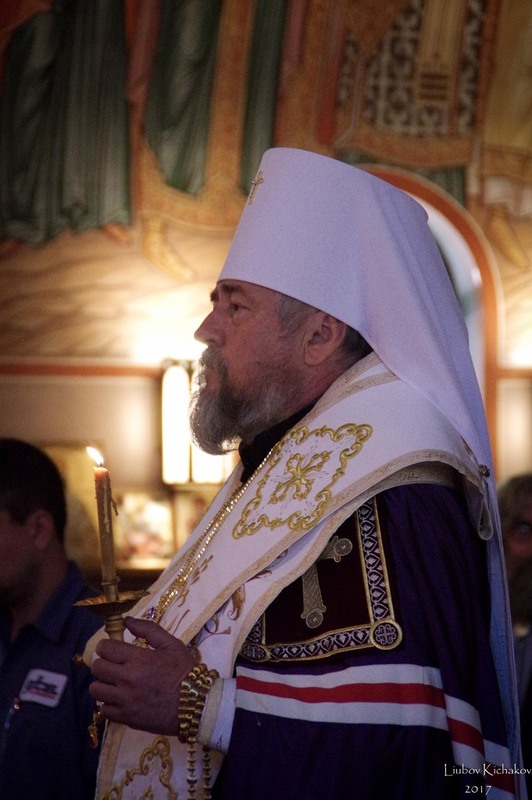 That evening His Eminence led the All Night Vigil in the Diocesan Cathedral of the Protection of the Mother of God along with Archbishop Peter. 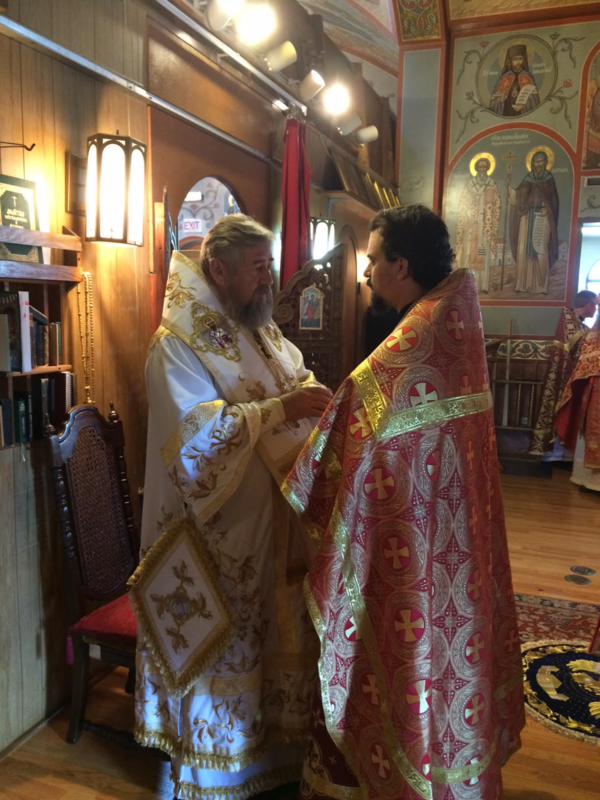 The next morning His Eminence was greeted by the cathedral clergy along with clerical guests. 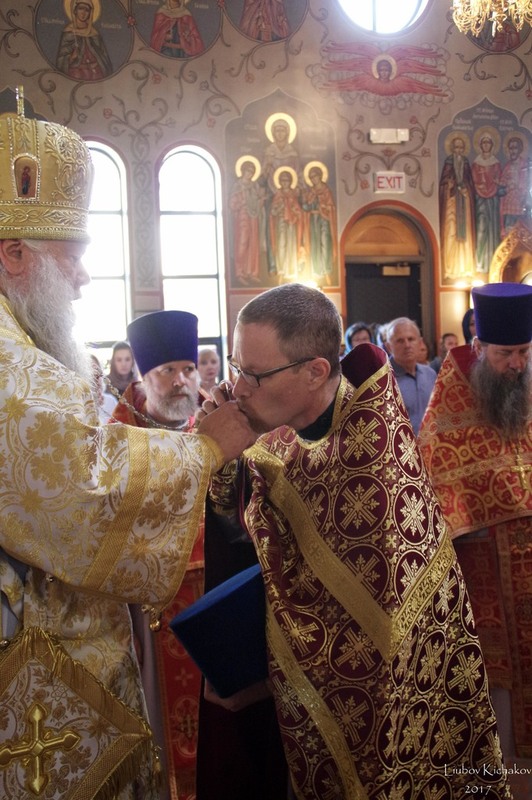 Following the Great Entrance, with the blessing of Archbishop Peter, His Eminence ordained Deacon Daniel Franzen of the Sts. 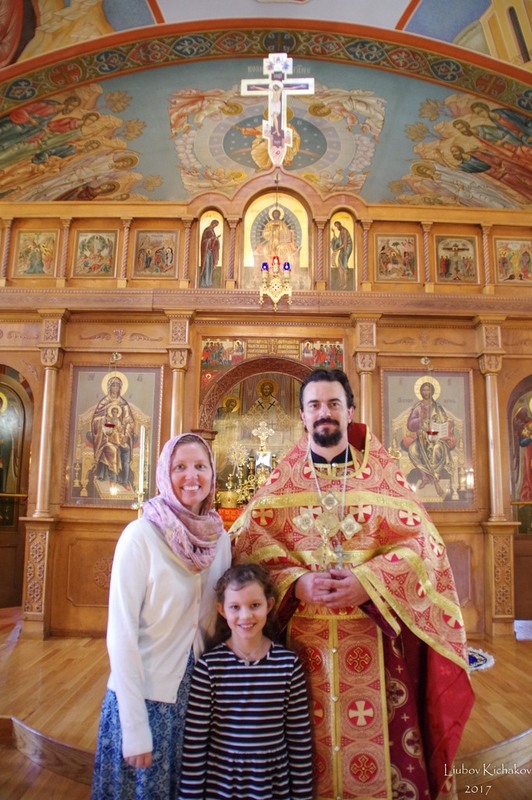 Joachim & Anna parish in San Antonio, Texas to the Priesthood. 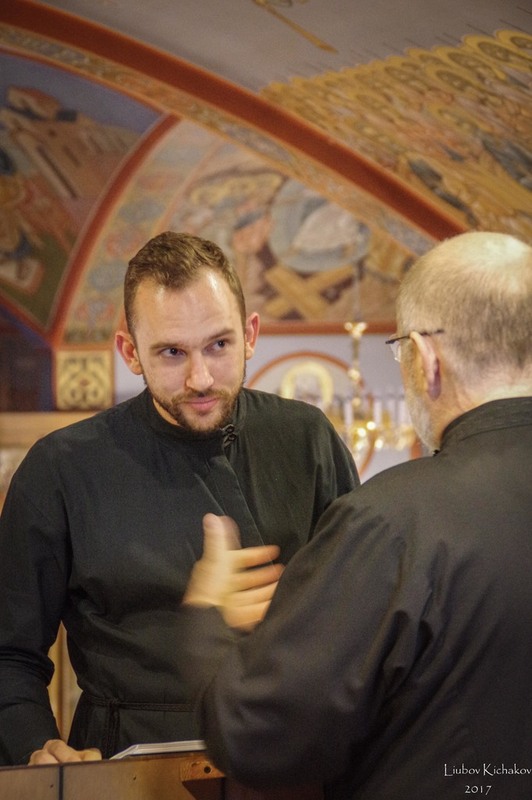 The newly-ordained Priest Daniel will soon be commissioned an officer and serve in the United States Armed Forces as a Chaplain. 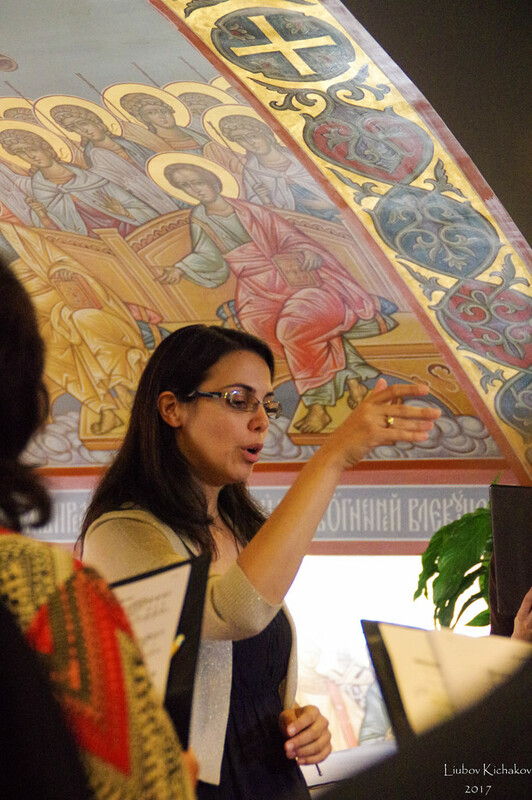 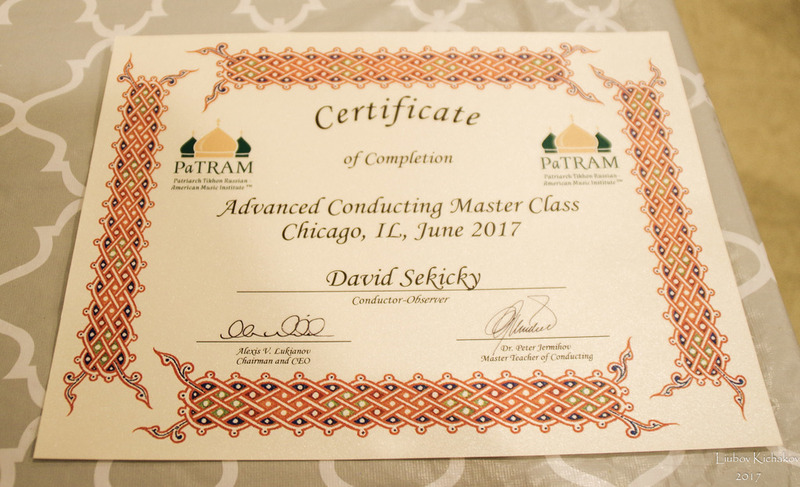 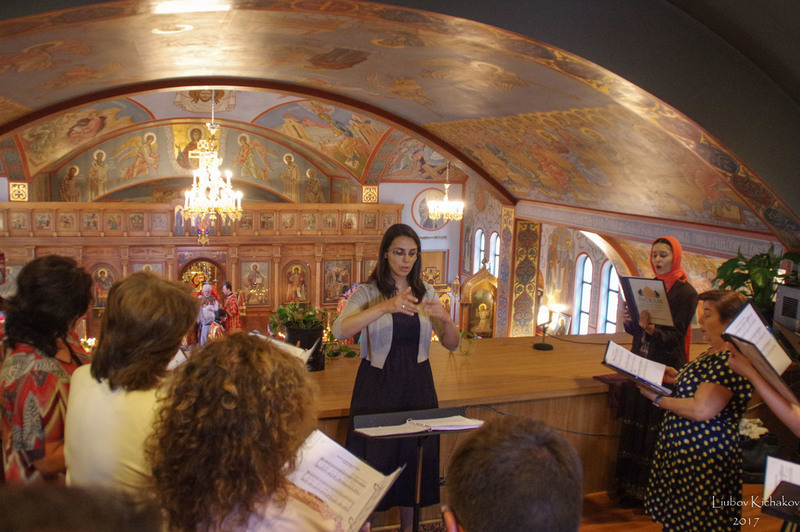 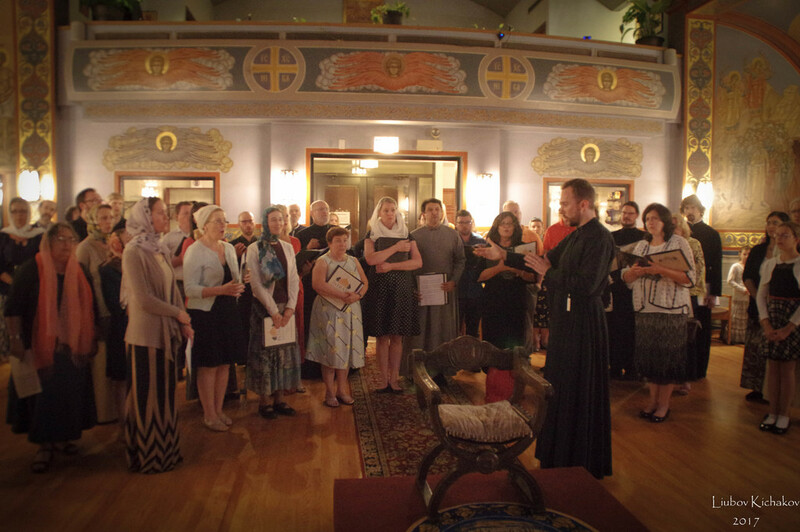 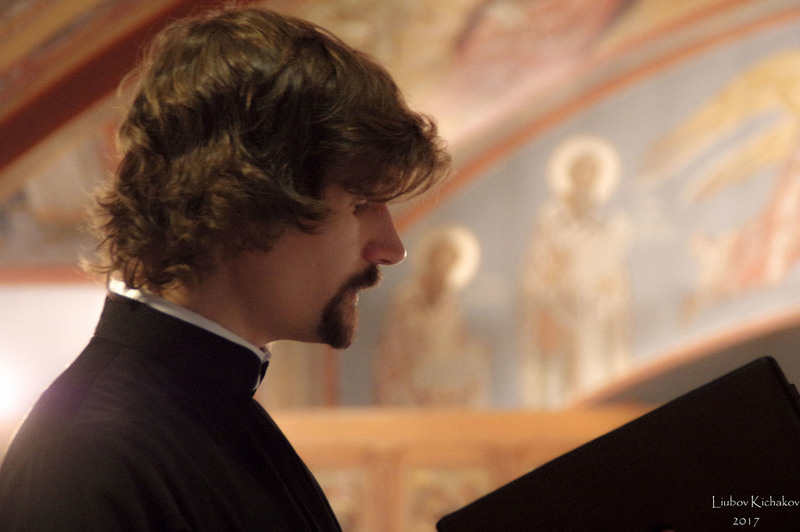 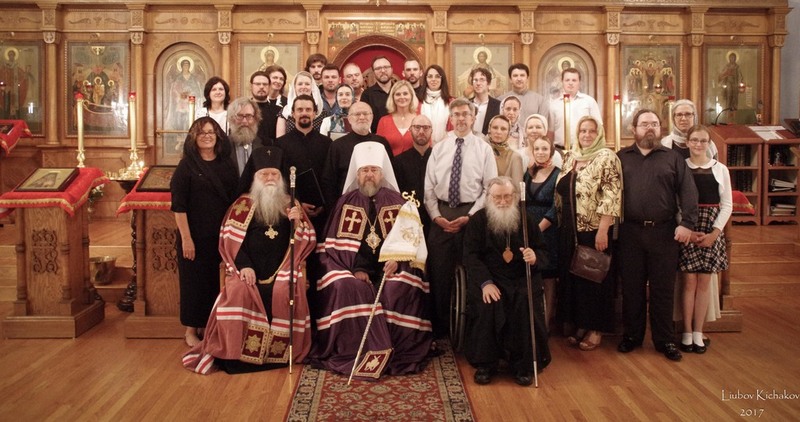 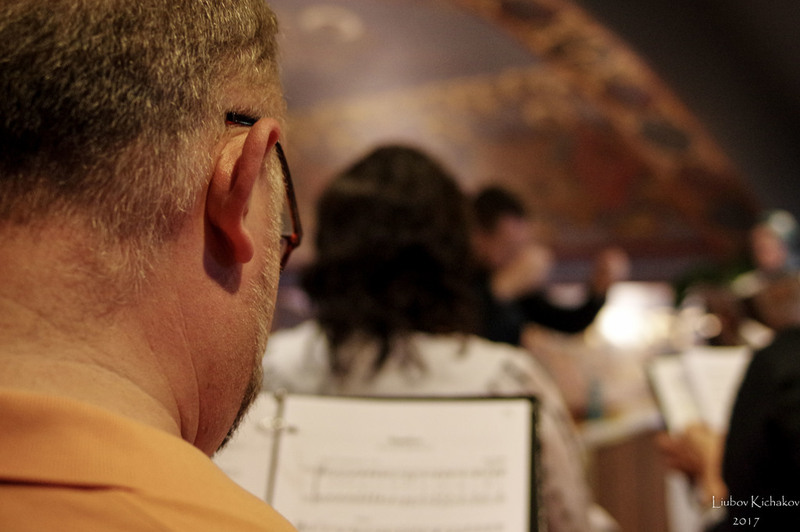 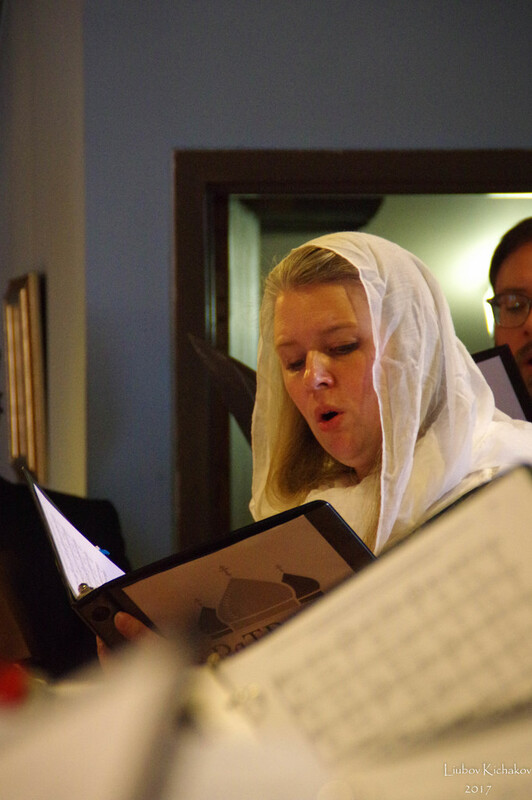 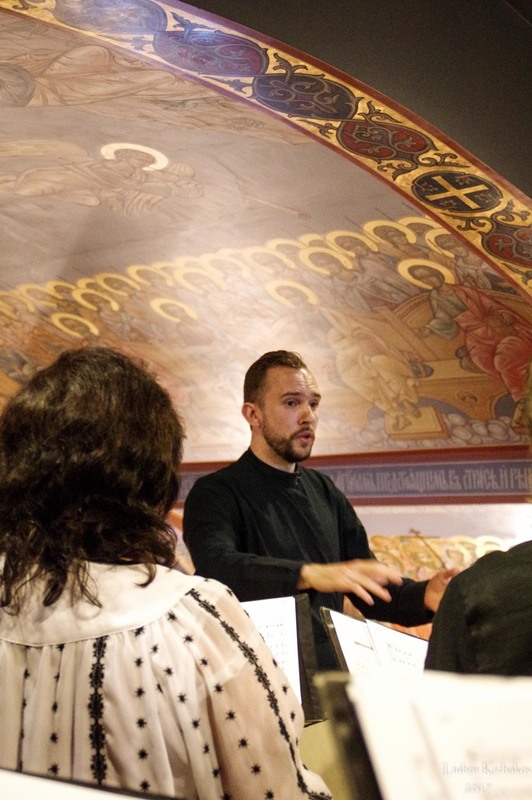 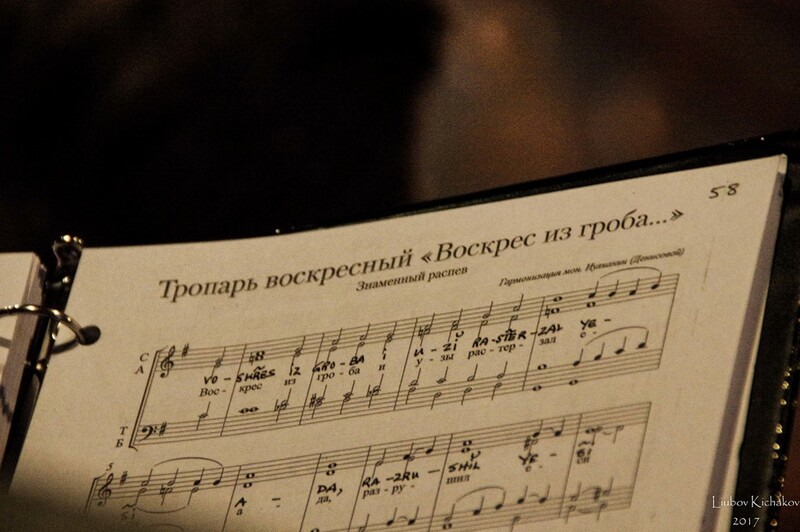 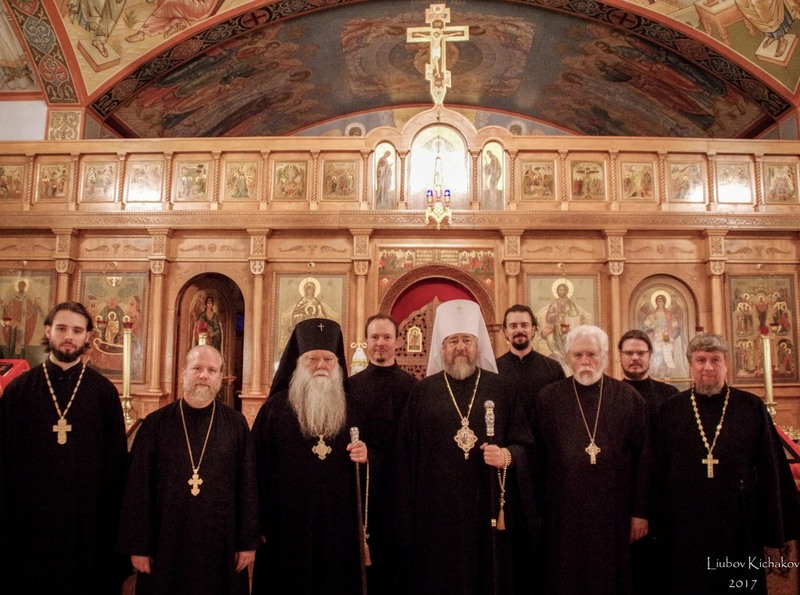 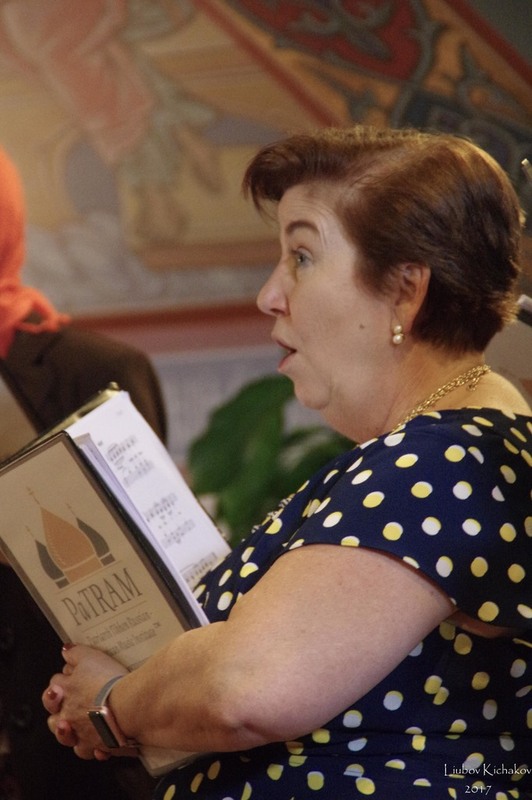 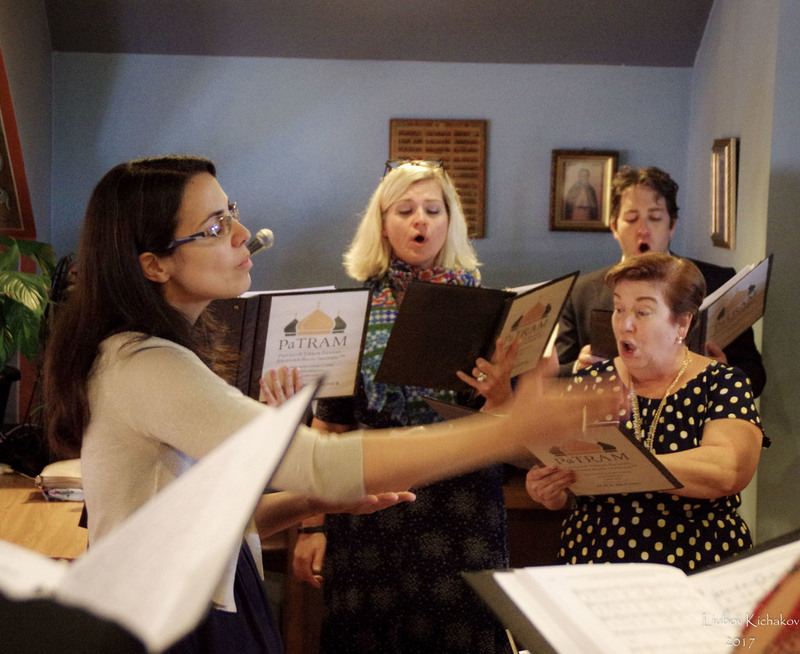 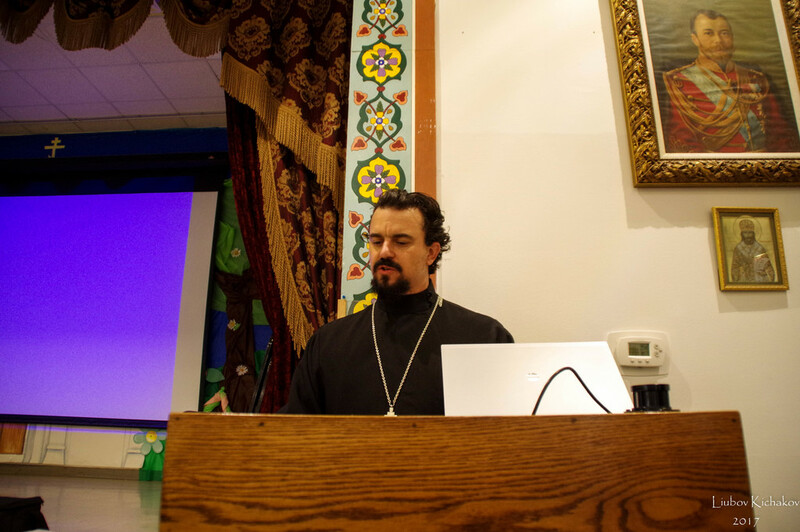 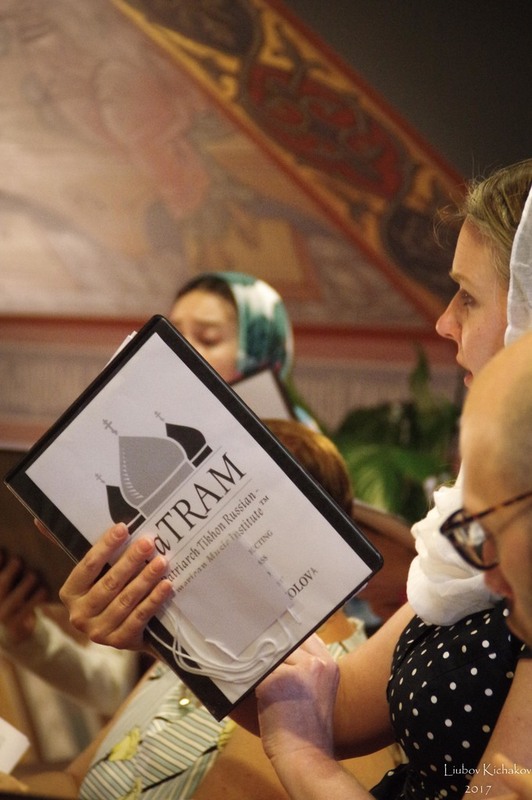 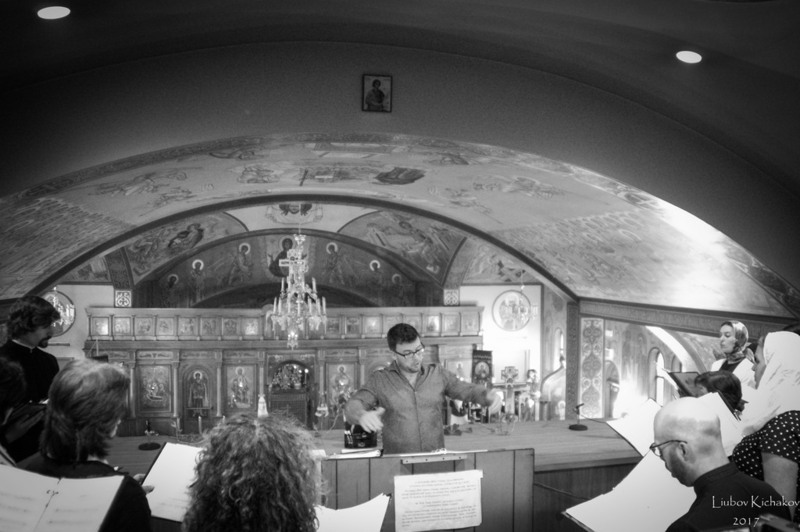 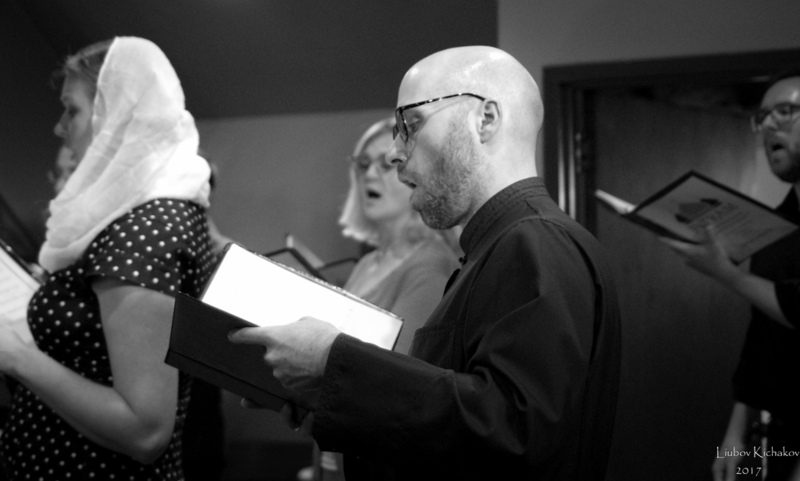 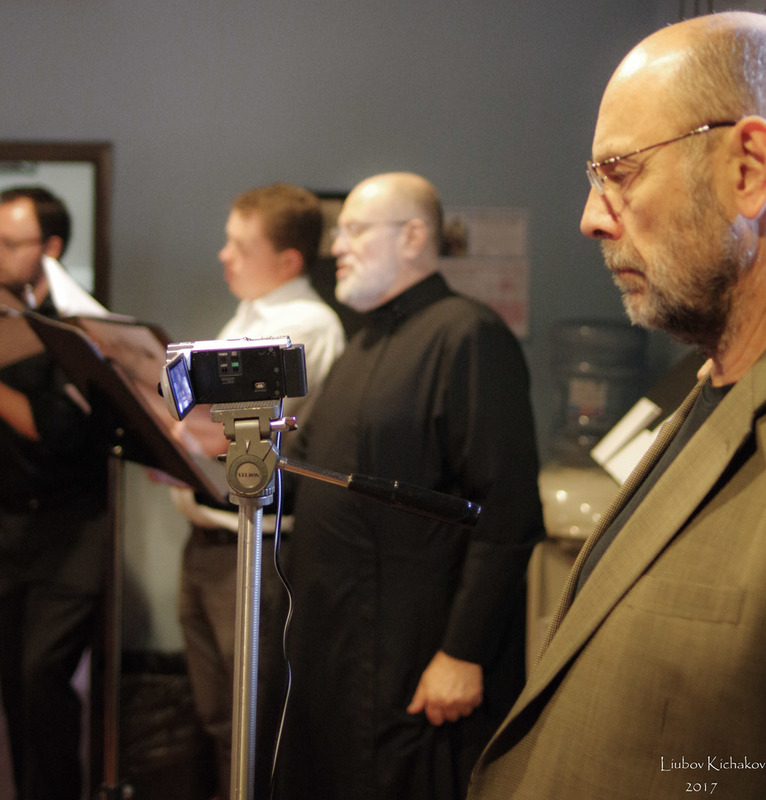 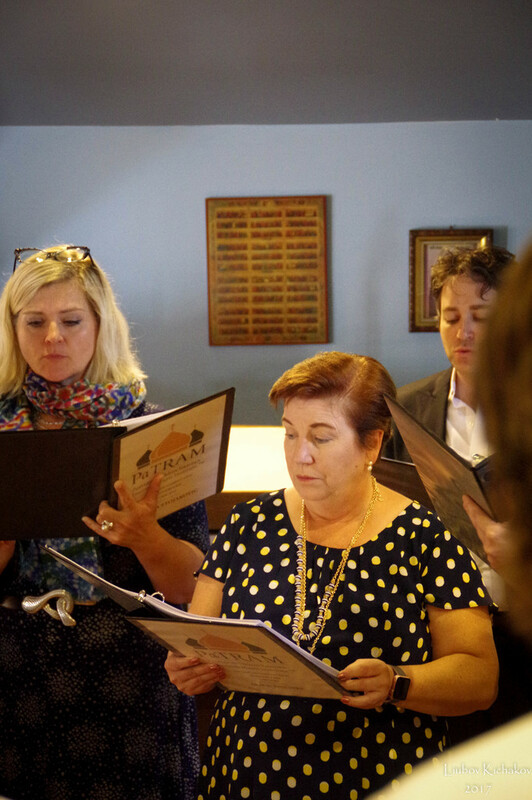 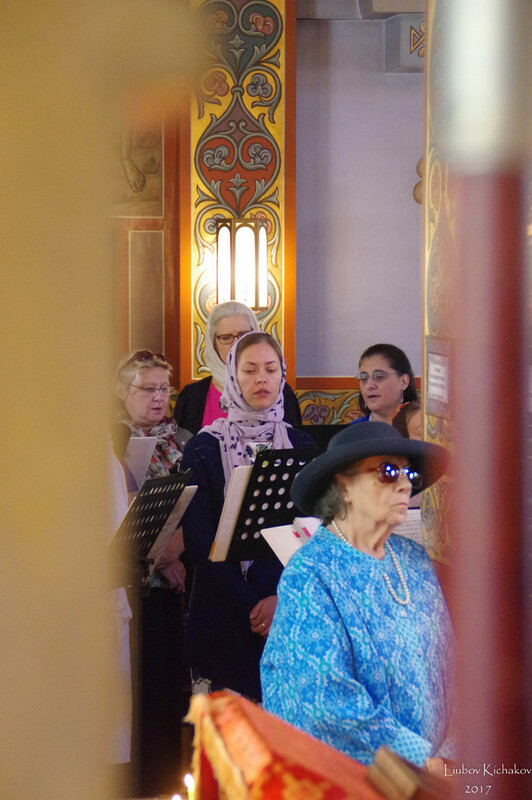 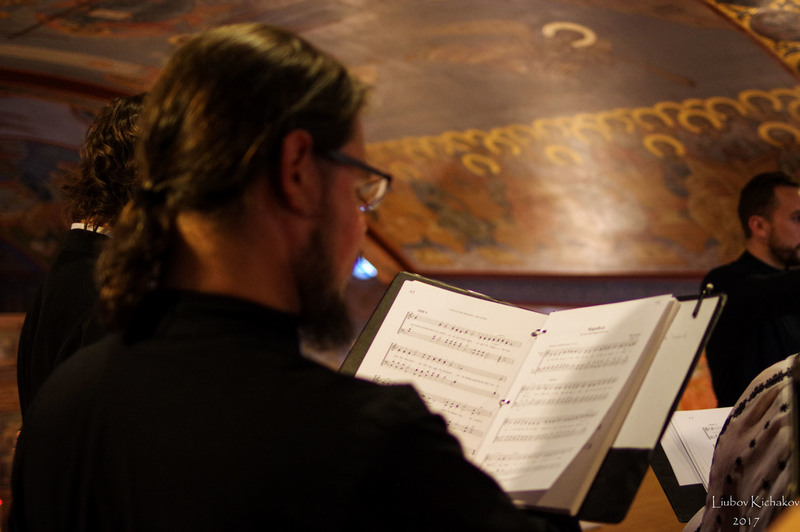 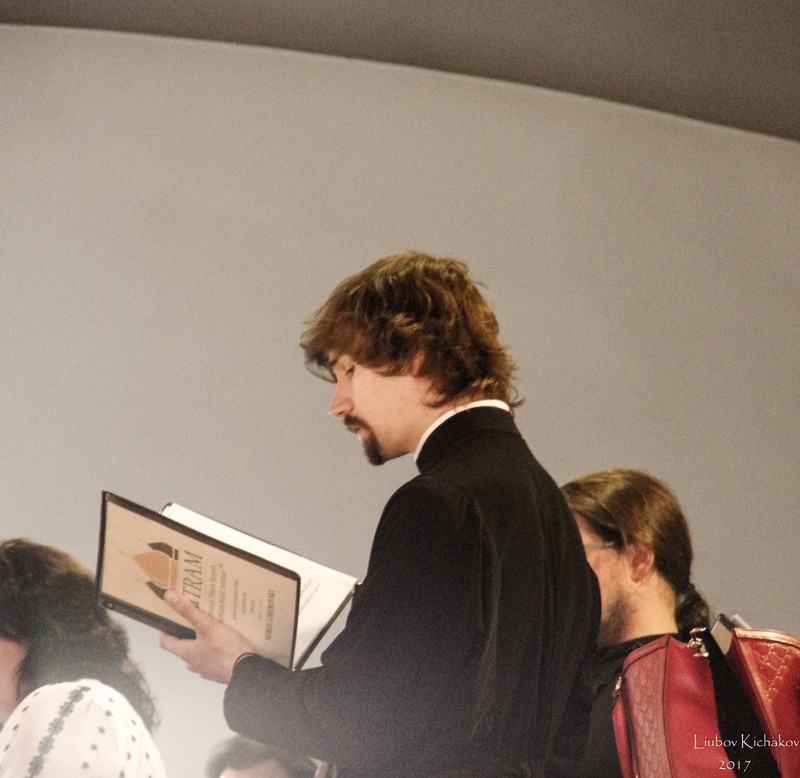 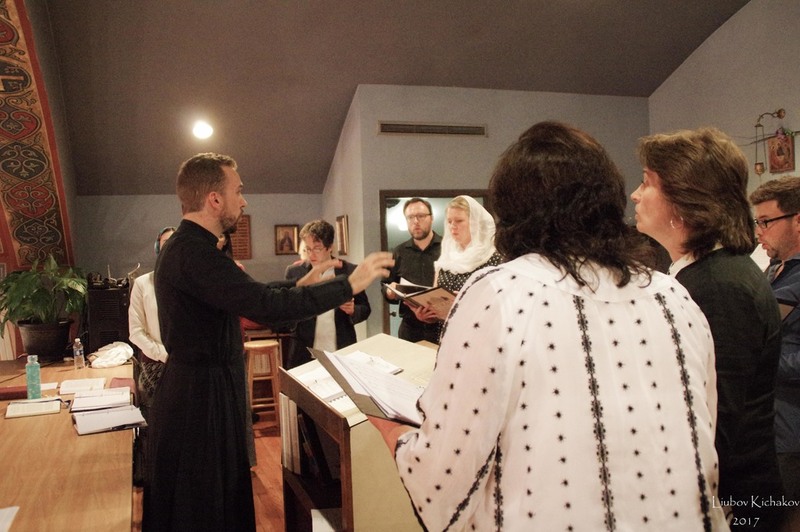 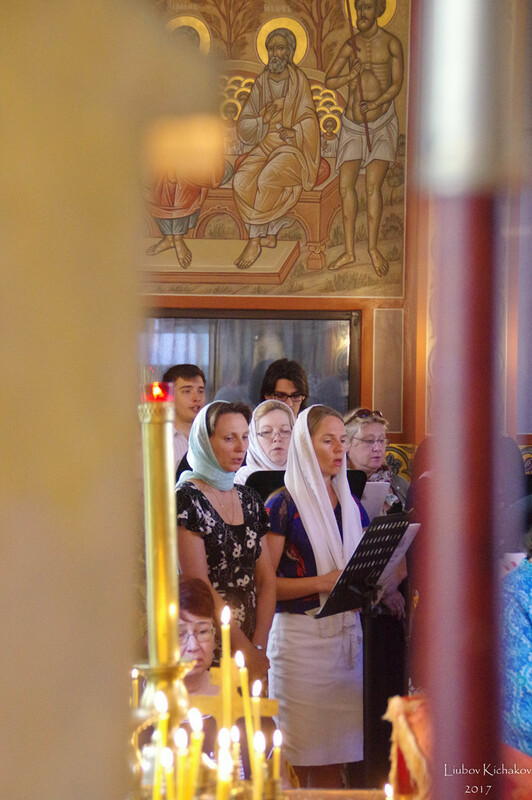 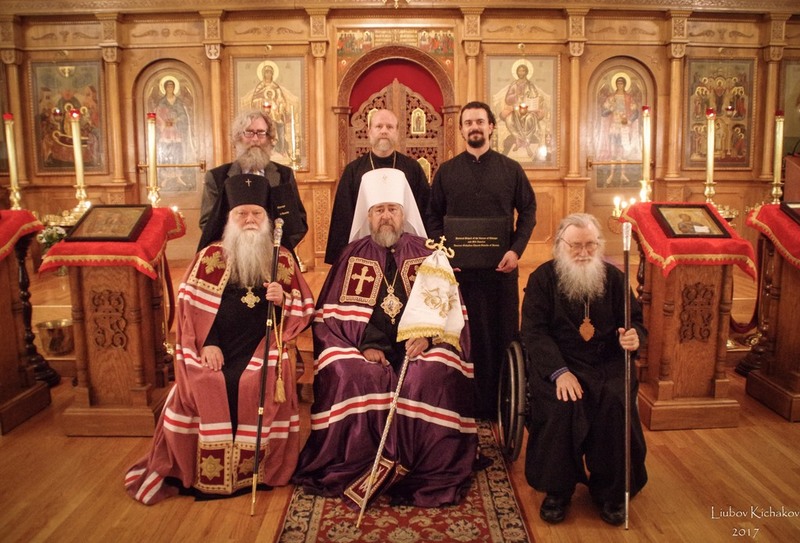 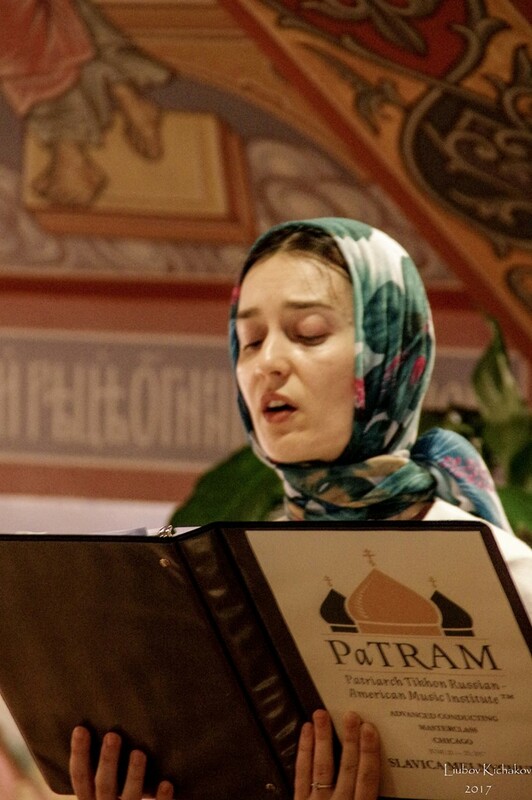 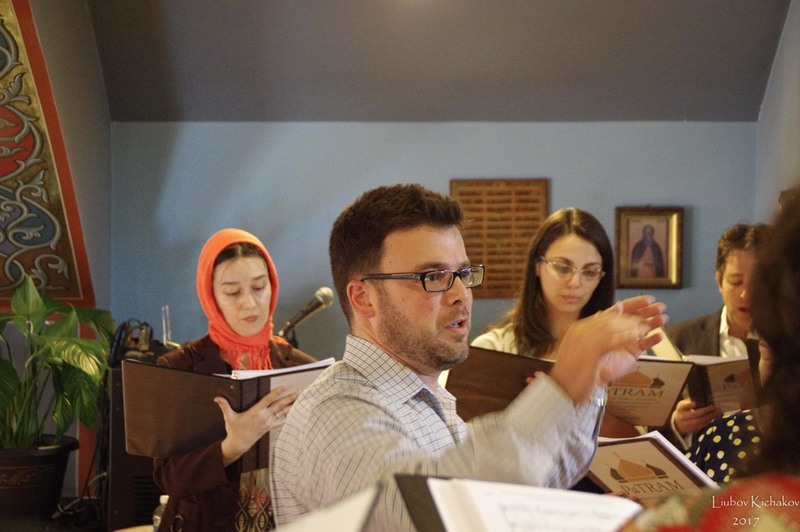 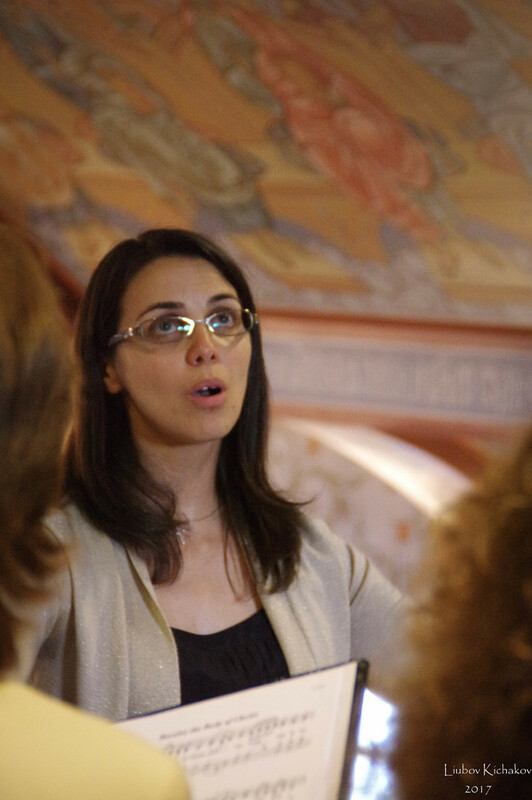 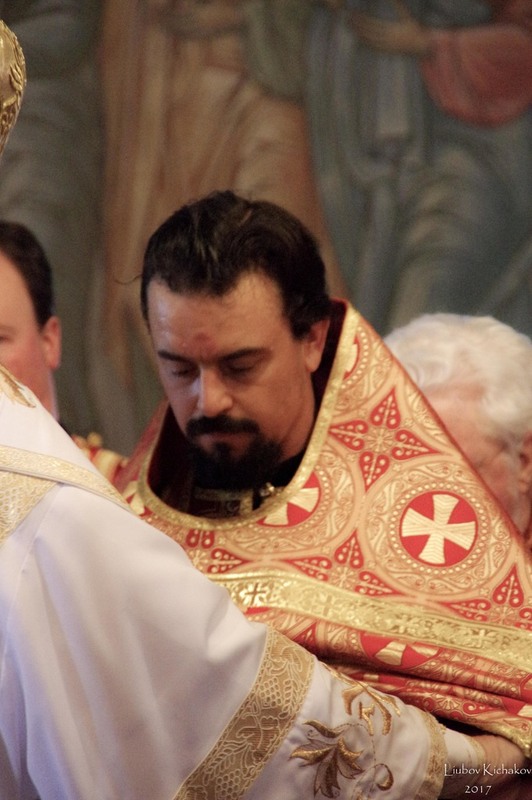 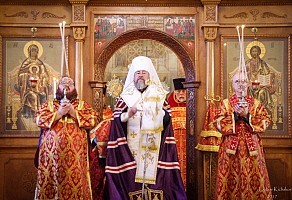 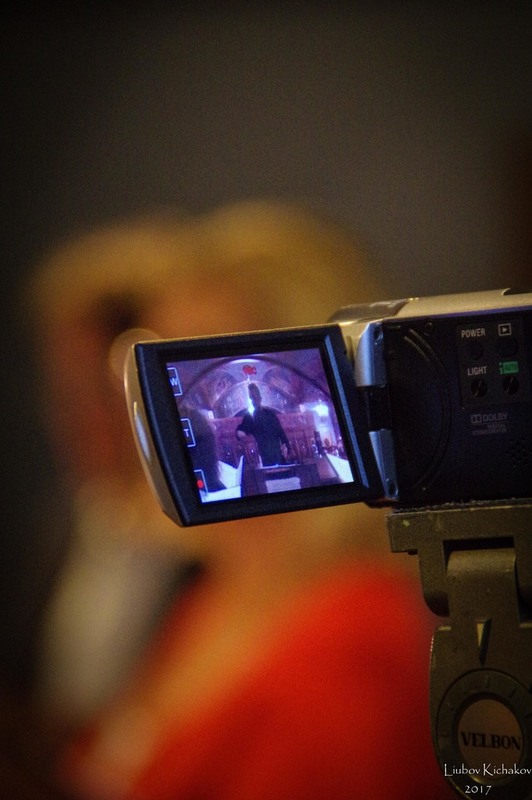 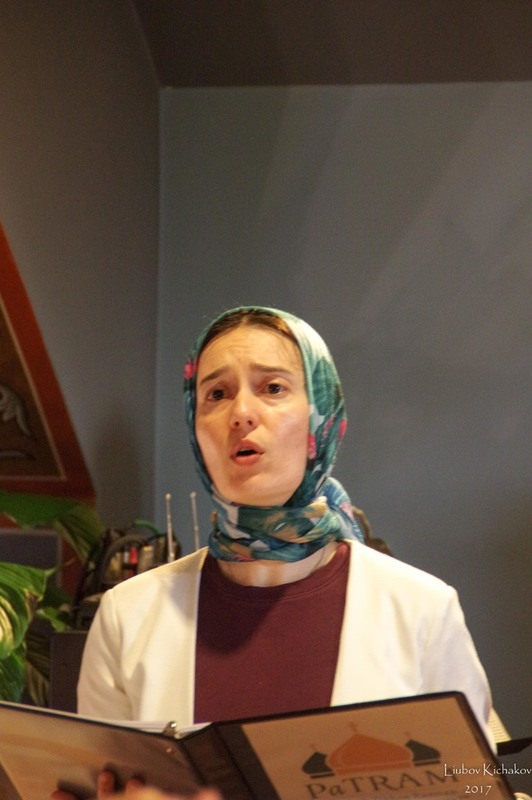 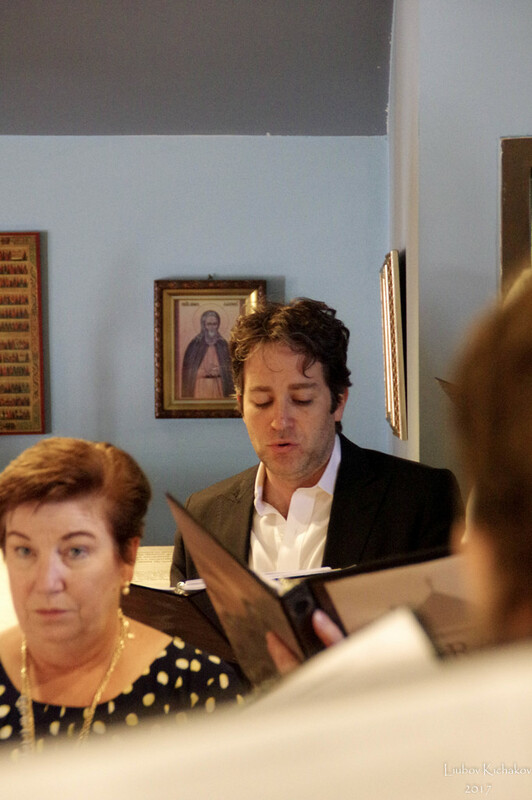 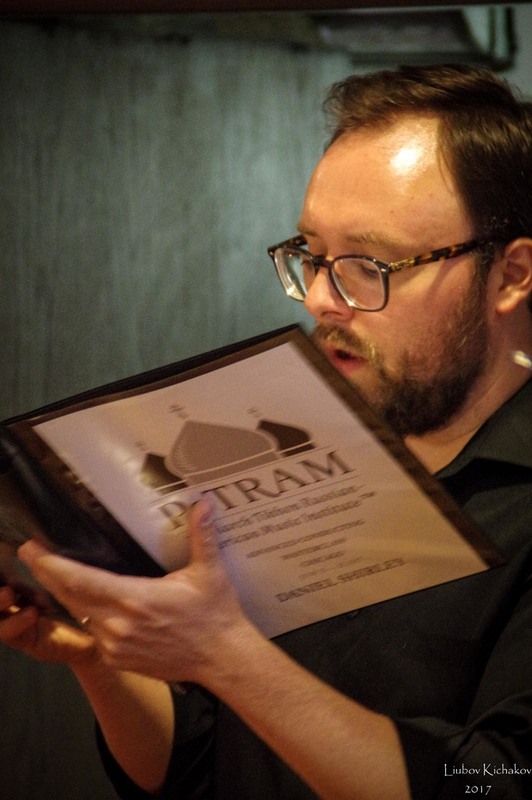 The Vigil and Divine Liturgy were sung by the Hierarchal Choir of the Cathedral, along with gathered singers and choir directors who were in Chicago to participate in a PaTRAM https://patraminstitute.org/ sponsored Master Class. 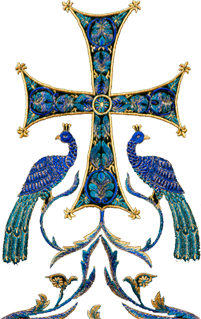 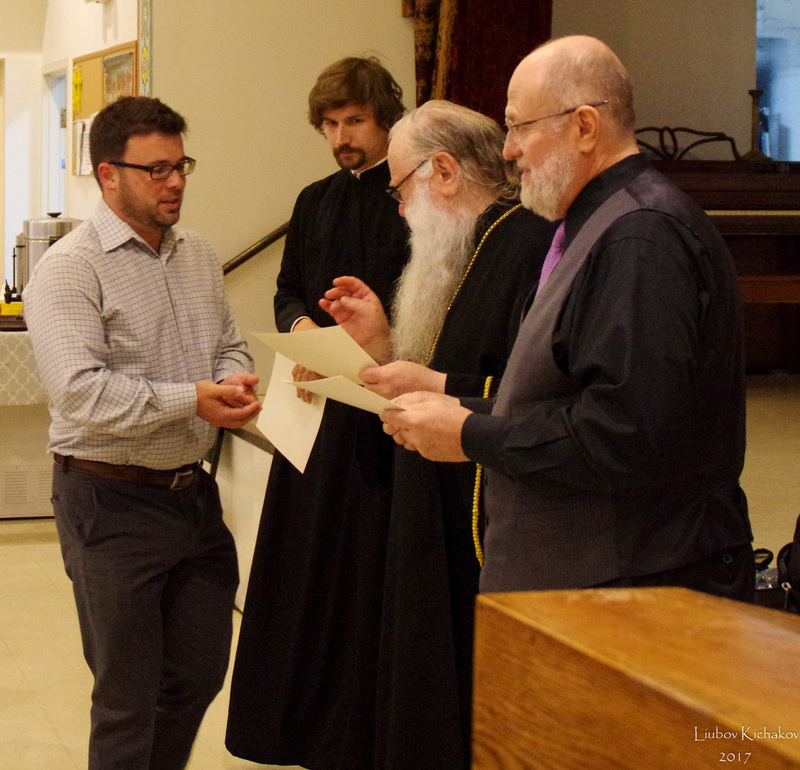 At the festal meal following the Divine Liturgy in honor of Metropolitan Phillip those who completed the Master Class were recognized. 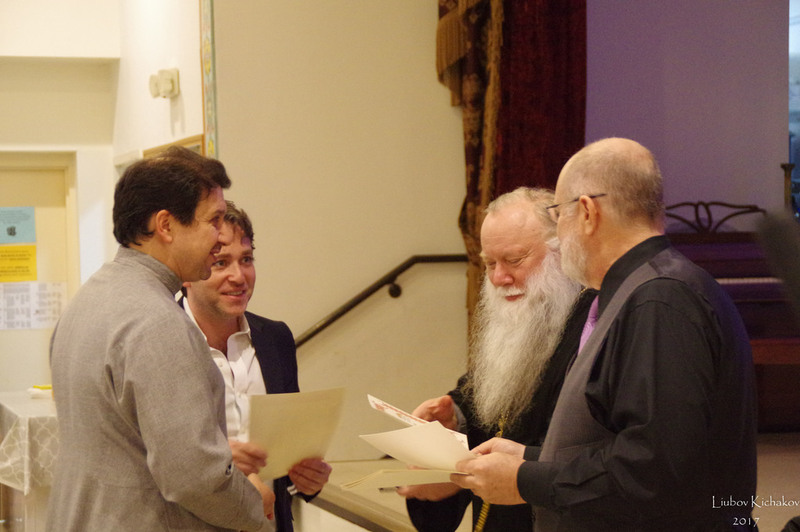 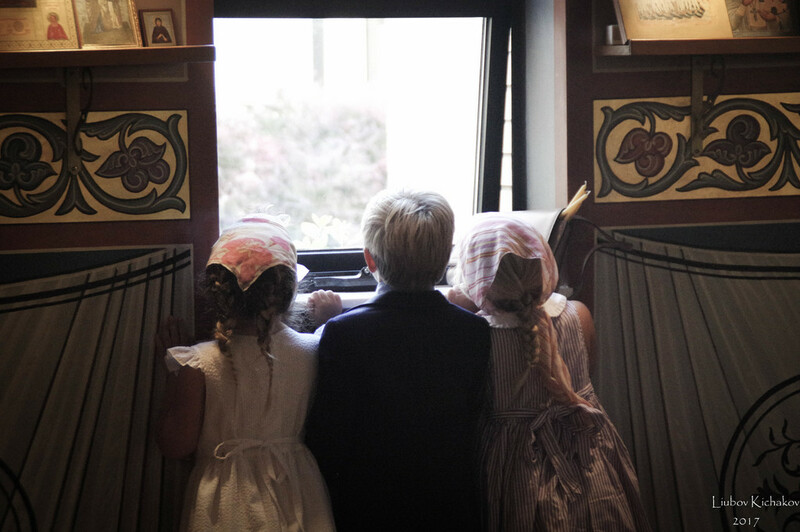 Further, the Pastoral School’s Graduation Symposium took place. 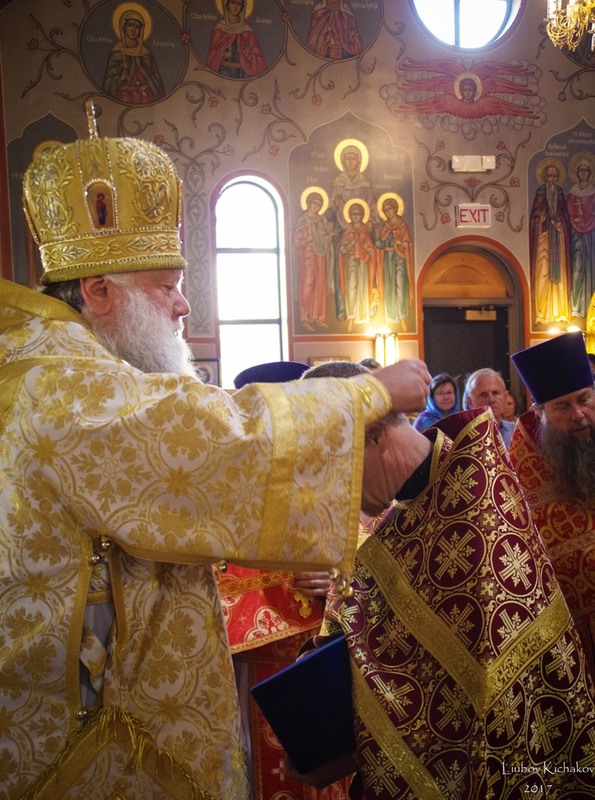 The Diocese of Chicago & Mid-America was honored by the prayerful presence of His Eminence, Metropolitan Phillip, and is indebted to His Eminence for his brotherly love and counsel. 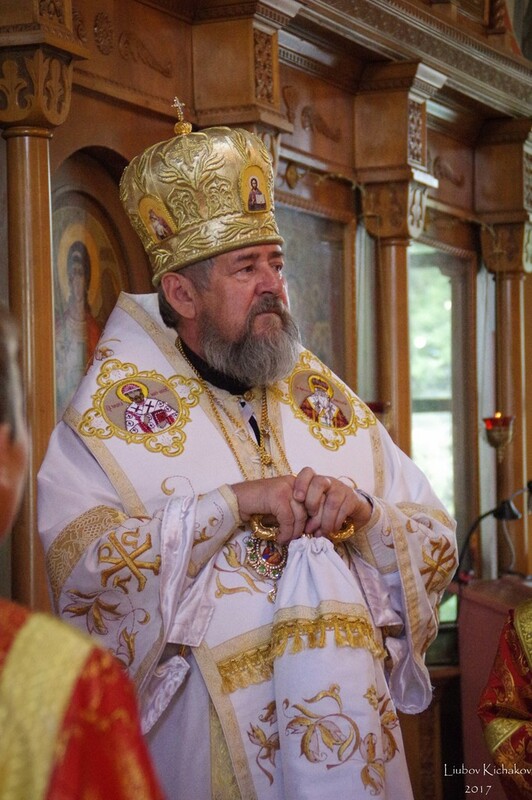 May the Lord grant him many years of service in the Vineyard of the Lord!